and help build goodwill and peace in the world." to help better your community, country & world (b'fast pies made to order)! Please be sure to check our calendar for location changes as we are not always meeting at iPie. Rotary Club of Broomfield Crossing is so proud to have two of our members recognized at the Heart of Broomfield Award dinner tonight. 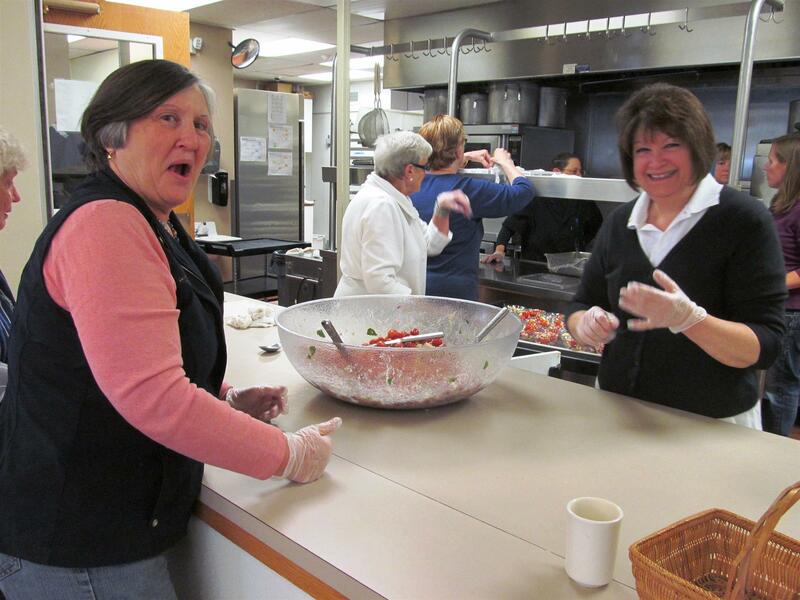 Marie Rowe was recognized with the Philanthropic Award recognizing an individual who opens up their heart and wallet to support a Broomfield non-profit organization or program. Peter Crouse was recognized with the Gene Frank Award recognizing a business person who has been a major community donor. 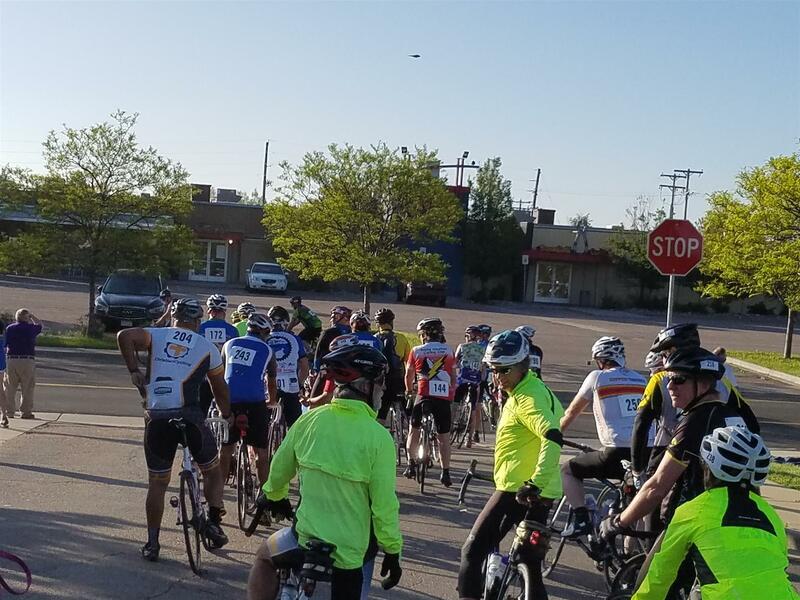 In memory of Gene Frank, a man who virtually defined the term corporate citizenship in Broomfield. 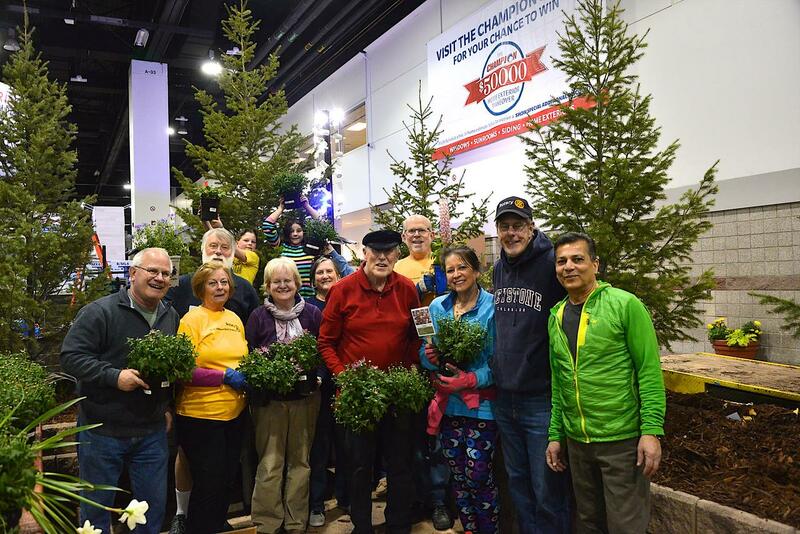 Thanks to all those who helped with this year's Flower Power where Rotarians join together to collect flowers and plants from the Home & Garden Show at the Convention Center on the last Sunday evening of the show, and then deliver them to nursing homes to bring a little cheer to those who don't get out much. 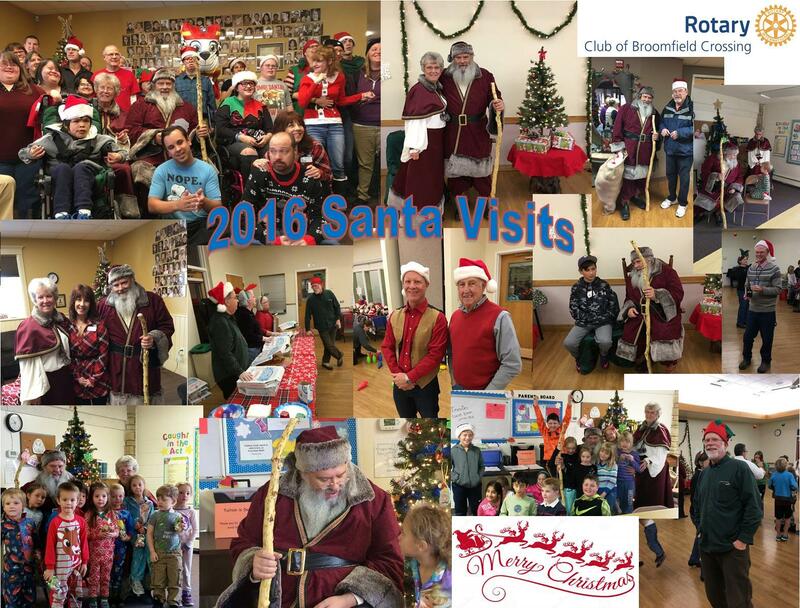 In the pictures you'll see a mixture of Broomfield Crossing Rotary members and Broomfield evening Rotary Club. A special thanks to Gerry Case for the photos. 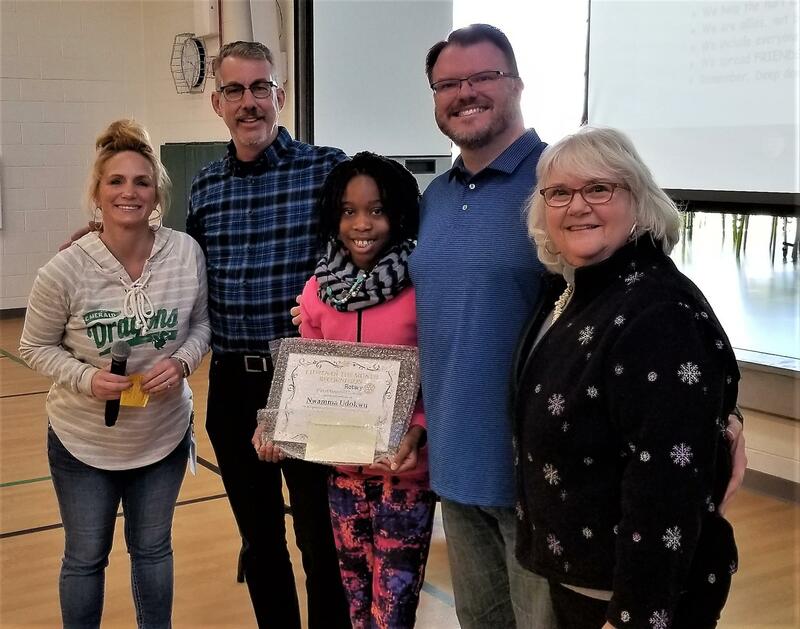 This morning Rotary Club of Broomfield Crossing presented Emerald Elementary School Citizen of the Month to Nwamma Udokwu, a fifth-grade girl. Pictured with Nwamma are Emerald Principal Samara Williams, Rotary Club President Jeff Power, Rotary Club President-Elect Michael Blackwood and Rotary Club Emerald Liaison Carol Norcross. 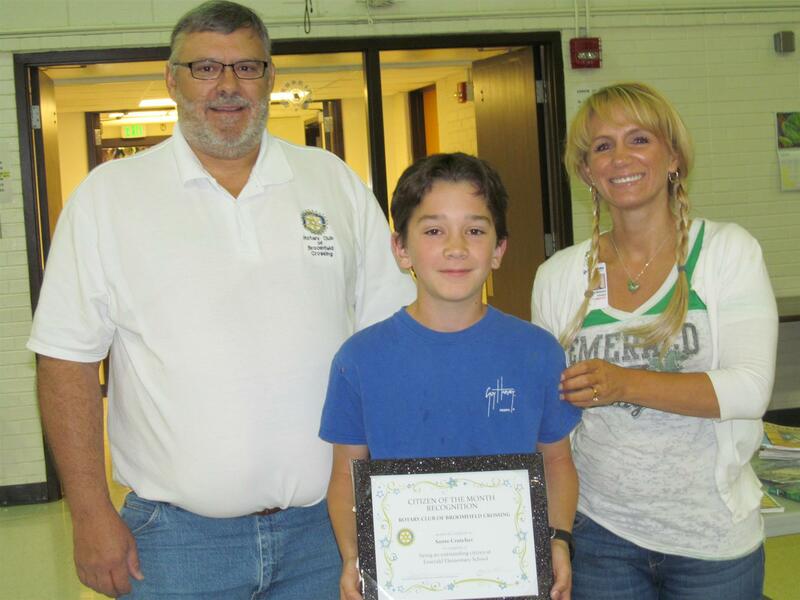 The Rotary Club Citizen of the Month Award is presented to the student for exemplifying the Rotary 4-Way Test. Congratulations to Nwamma and her family. 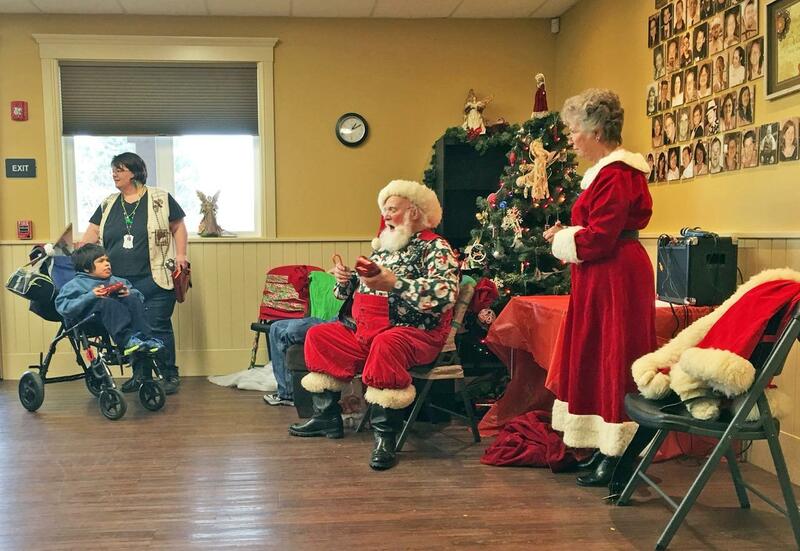 We had a great time with our Santa/Father Christmas visits last week. See below some pictures of the different days. 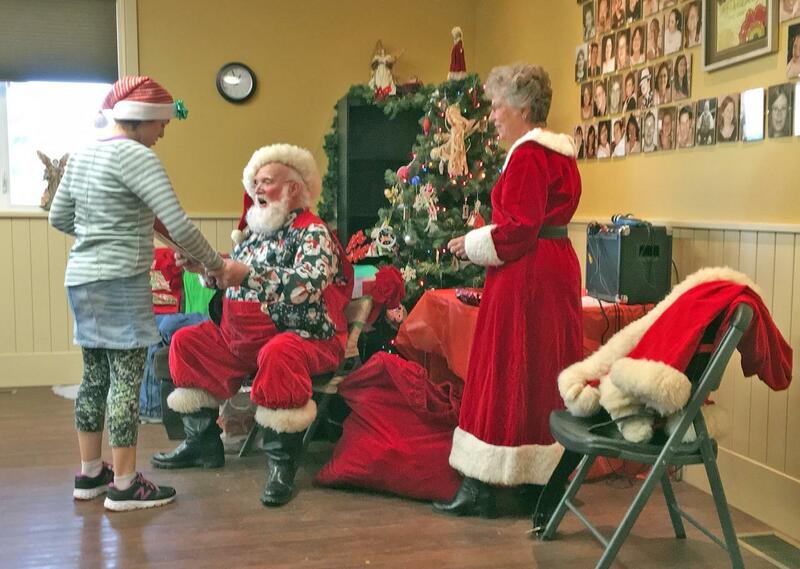 A special thanks to Mike Daniels and Marie Rowe for playing Father and Mother Christmas. 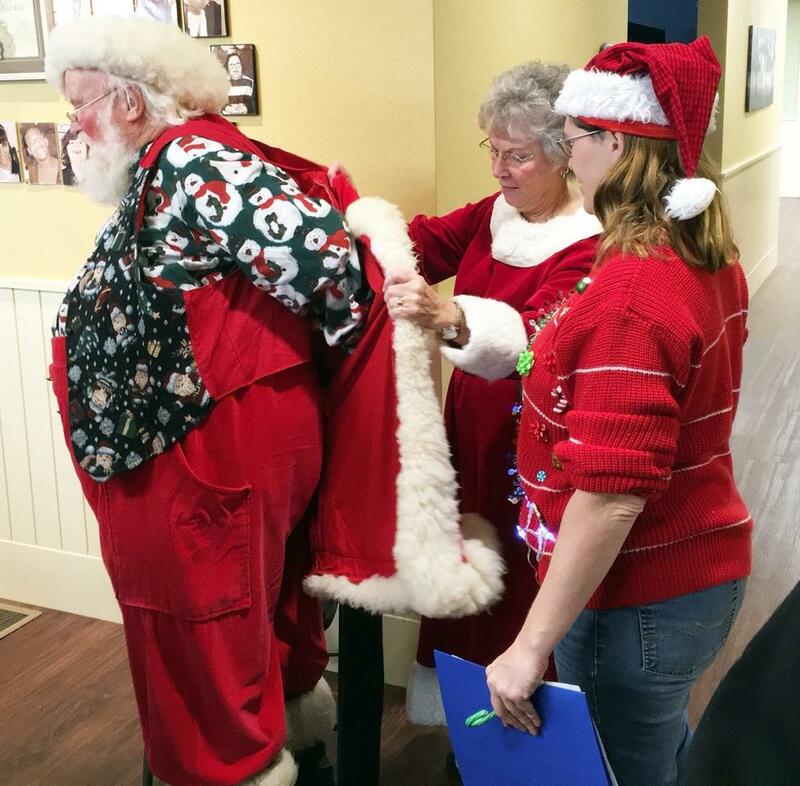 Our Rotary Club started our week of Santa/Father Christmas & Mrs Claus visits Tuesday, Dec 4th with the Kohl Street Kids preschool classes at the United Church of Broomfield. 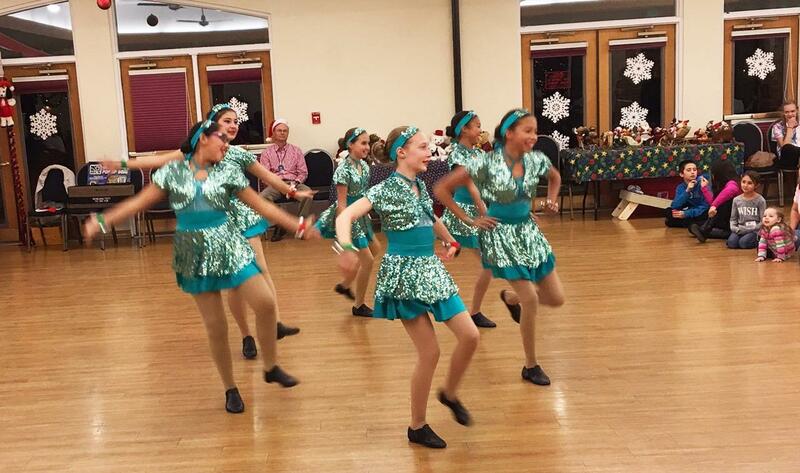 Wed, Dec 5th with the Kohl Street Kids after school program at the United Church of Broomfield. 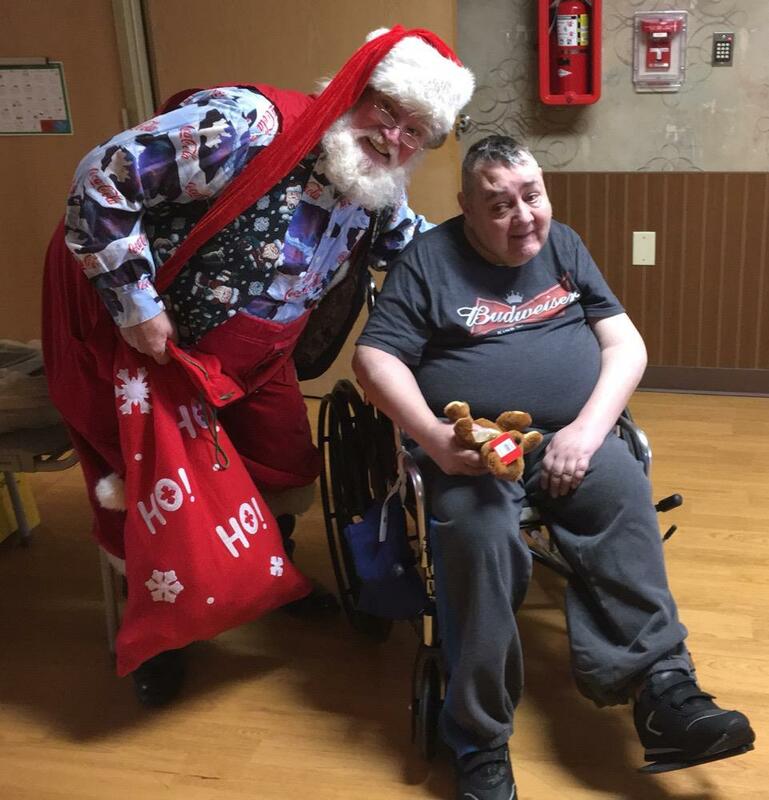 Thur, Dec 6th evening we hosted a party for the families serviced by Broomfield HHS with games, crafts, dinner, a chance to get a gift from Father Christmas, and entertainment. 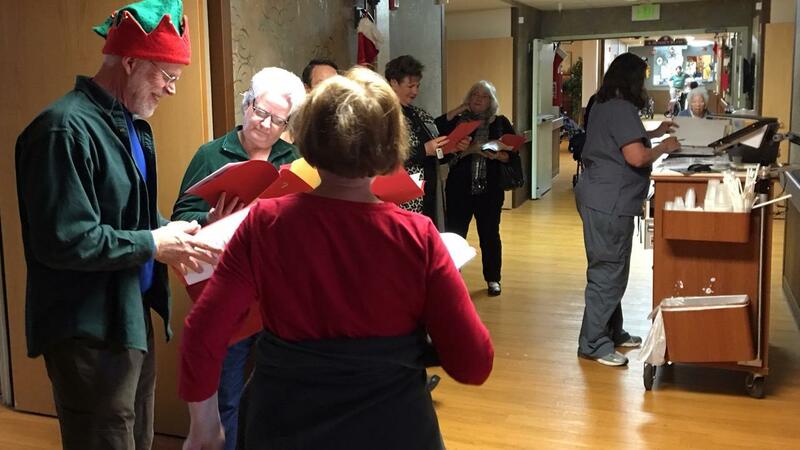 Fri, Dec 7th morning our crew from our Rotary Club sung carols throughout Broomfield Skilled Nursing, presenting each patient with a stuffed bear and a chance to get their picture with Father Christmas. 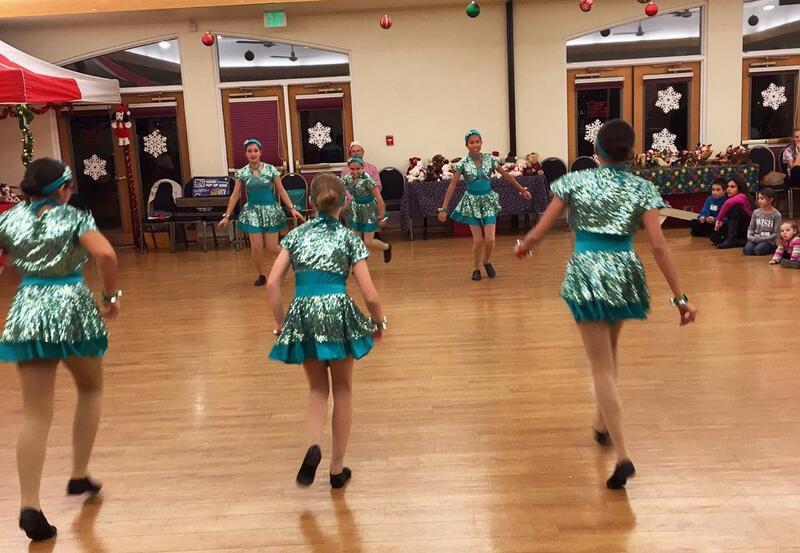 This is always a very touching tour we make and we hope that we brought some cheer to everyone there. 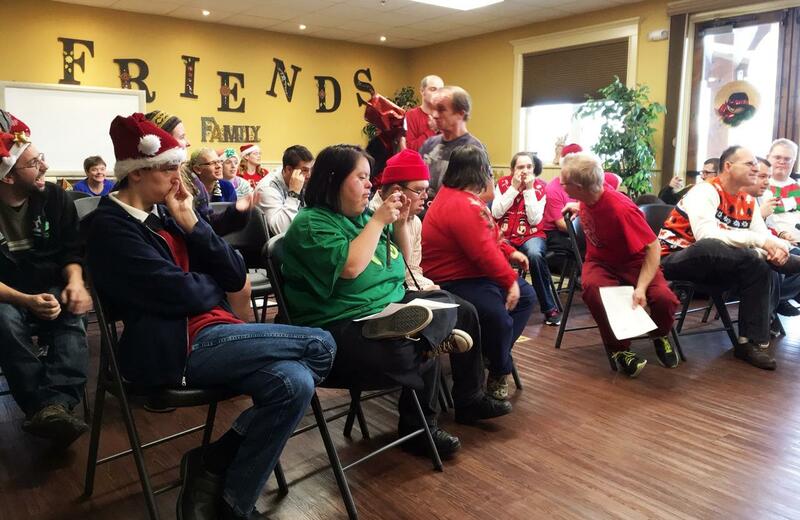 We hope the patients and staff have a very Merry Christmas! Thanks to Carolyn Crouse for being our choir director! 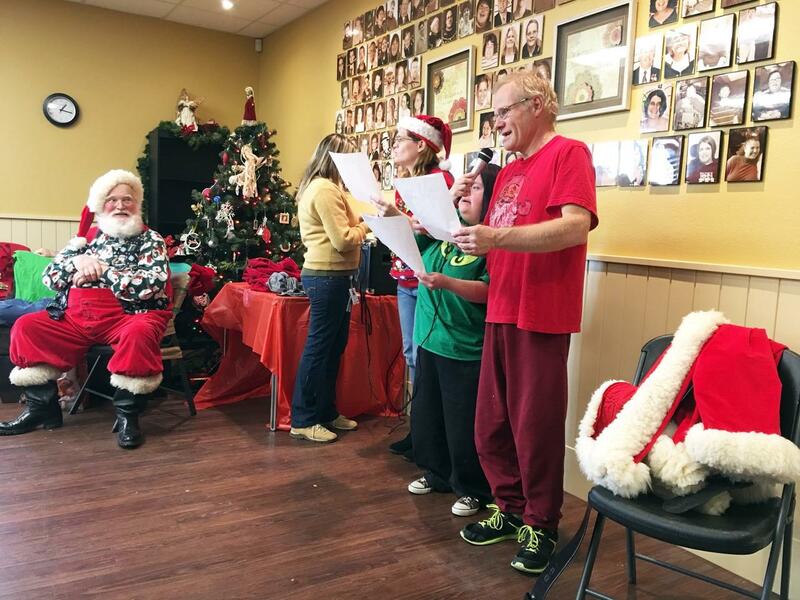 Fri, Dec 7th afternoon Father Christmas and Mrs. Claus along with other members from our Rotary Club, sang carols and presented gifts to all those special people at F.R.I.E.N.D.S. of Broomfield. Today our Rotary Club presented to Addy Pfitzer and Paxton Laser Citizen of the Month at the Emerald Elementary School assembly. They were nominated by Mr. Chavez for outstanding empathy, integrity and kindness during our Dragon Dash fun run. Even though both kids had qualified for the challenge run, when they came upon a struggling and sad kindergartner, they stopped their challenge runs and ran the rest of the race with that kindergartner (at a snail’s pace). All three crossed the finish line together with an extremely proud kindergartner! 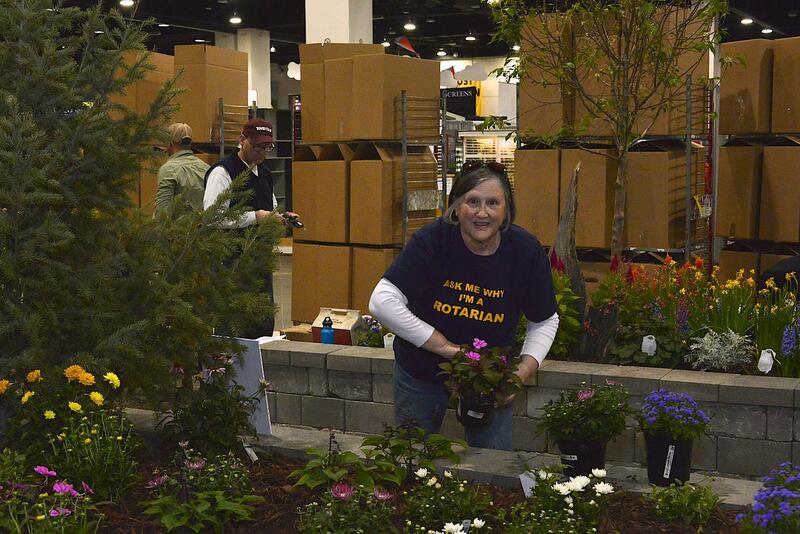 This truly is living in the Rotary motto of "Service above Self"! 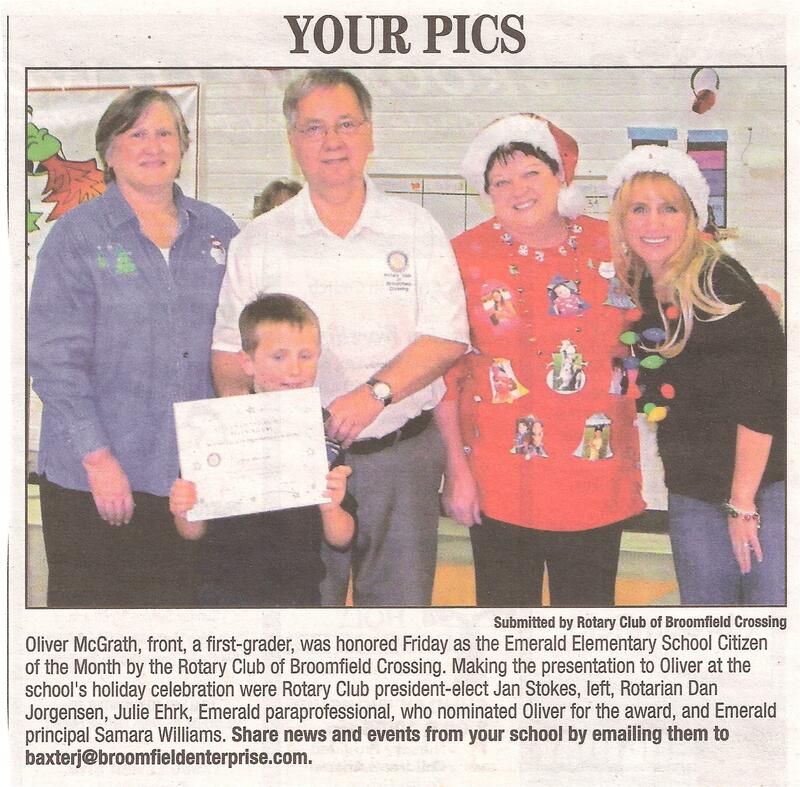 Pictured with Addy and Paxton are Emerald Elementary School Principal Samara Williams, Rotary President Jeff Power, and Rotary Club Emerald School liaison Carol Norcross. 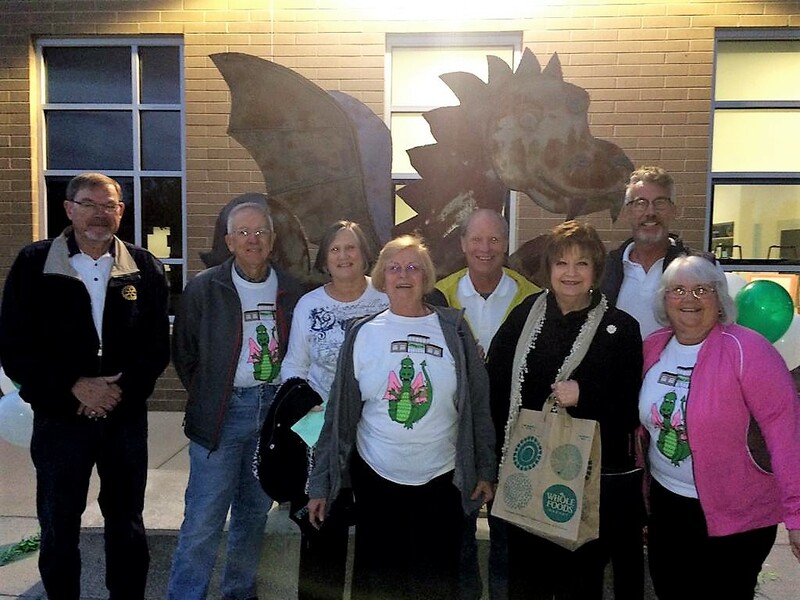 We are so pleased as a Rotary Club to support Emerald Elementary School, it's outstanding staff, and great students! 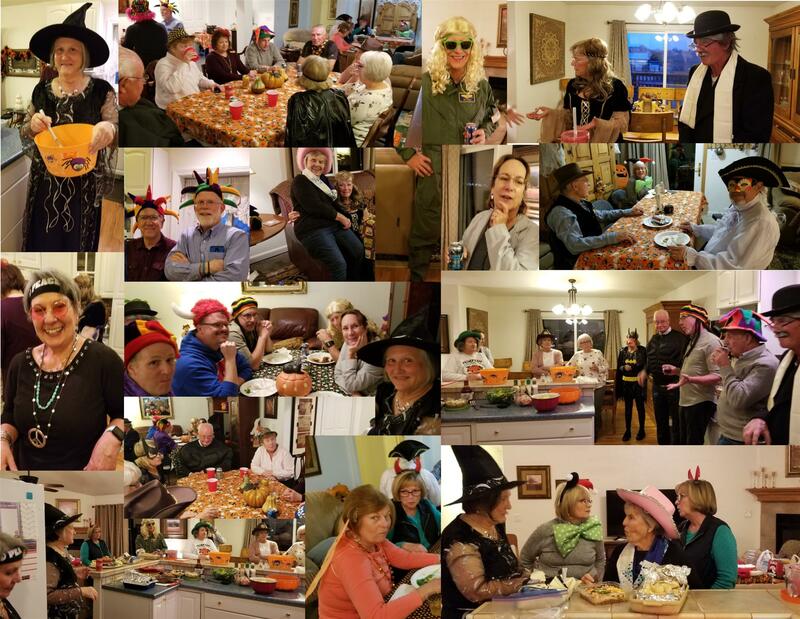 It was a great evening at our 5th Tuesday Halloween party at the home of Jan Stokes. 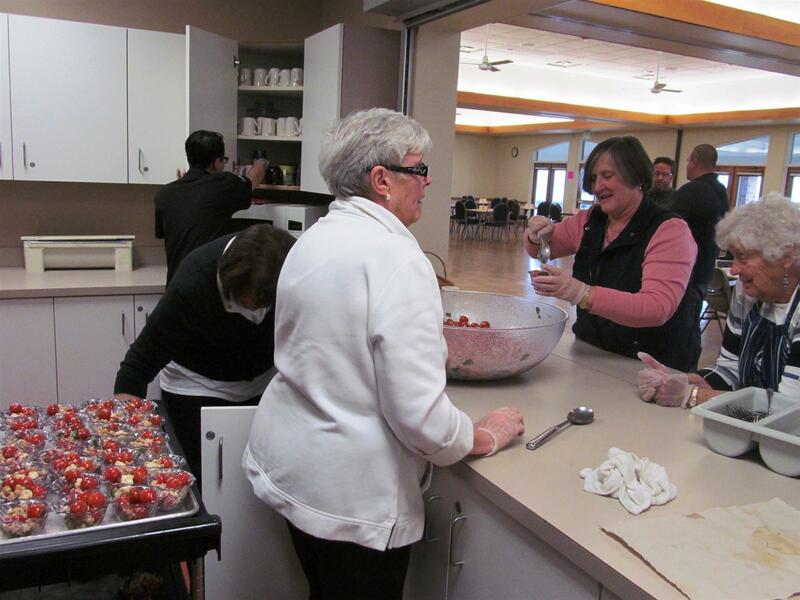 Thanks to everyone who attended, with a special thanks to Carol Scolari & Marie Rowe for furnishing the main course. We were so pleased to have our annual Installation Party tonight, awarding Jan Stokes with Rotarian of the Year, Jeff Taylor with the Anne Crouse Award & installing Jeff Power as President 2018-2019 & Michael Blackwood as President-Elect. 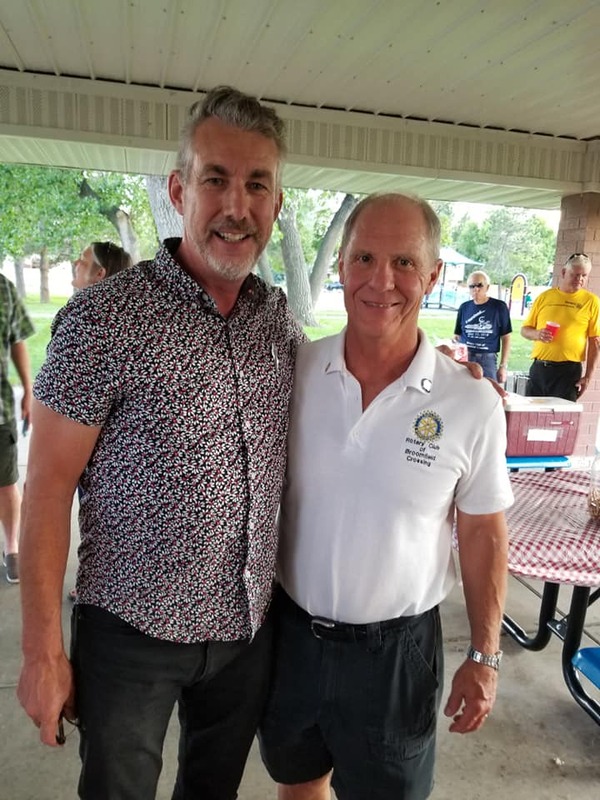 A special thanks to Jeff Jones for a great 2017-2018 Rotary year! Rotary Club of Broomfield Crossing Members with Sarah Lagarrique, our Foreign Exchange Student for 2017-2018 Rotary Year. 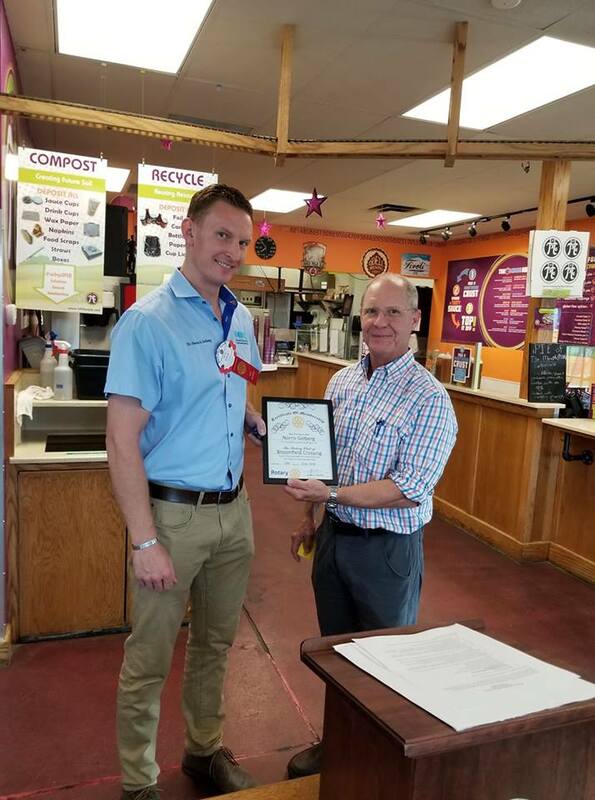 Congratulations to our newest Rotarian Norris Golberg who was inducted by our President Jeff Jones. We were very excited to induct 3 new members into our Club at this morning's meeting. 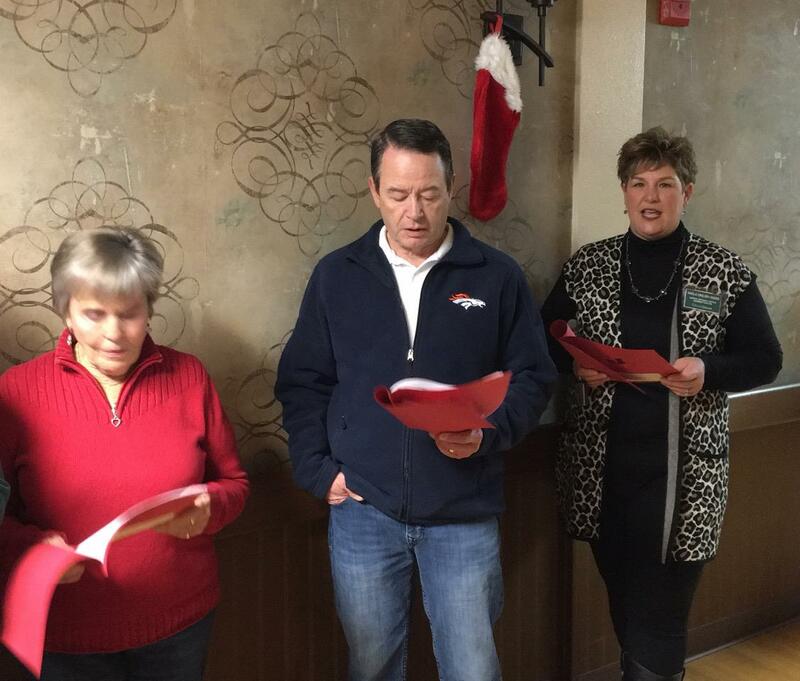 Shown pictured (l-r) are Carol Scolari, Chris Kassel, Jeff Plomer with club president Jeff Jones doing the presenting. 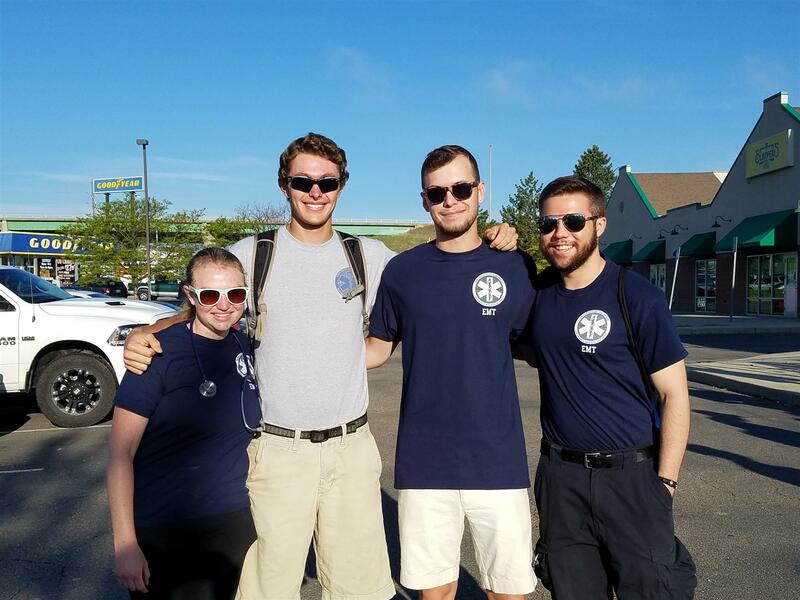 We look forward to having Carol, Chris and Jeff involved in all of our activities. 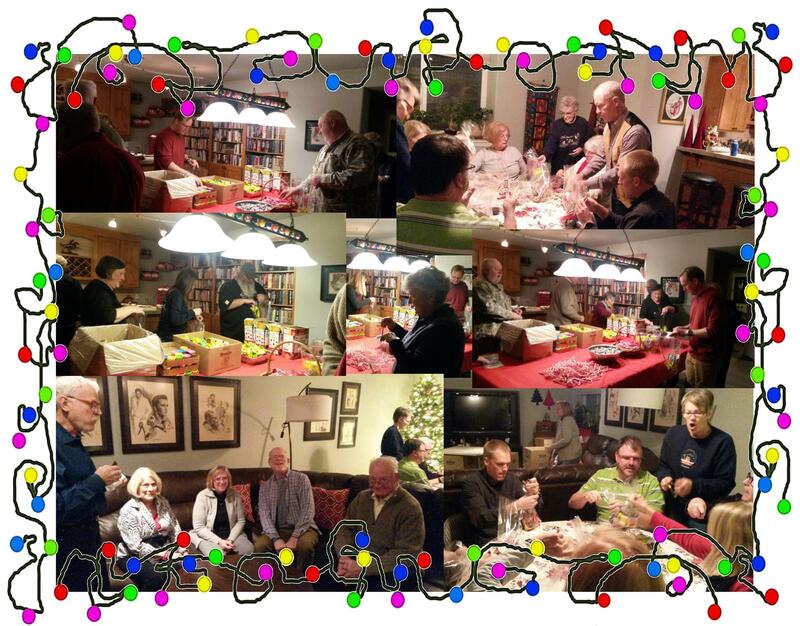 Everyone had a great time last night at our Santa Sack Stuffing Party in preparation for next week’s visits by Father Christmas to kids and adults to help spread some cheer during this most important part of the year. 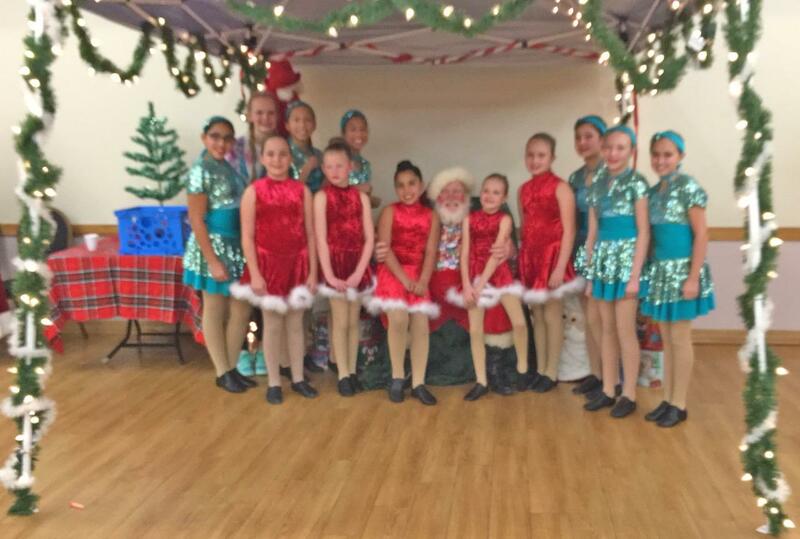 We will be hosting a party for a Military Police Battalion and their families, visiting a preschool and before/after school program, hosting a party in conjunction with Broomfield Health & Human Services for foster children & their families, caroling & distributing stuffed bears for patients at Broomfield Skilled Nursing, and helping with gift distribution at F.R.I.E.N.D.S. of Broomfield. 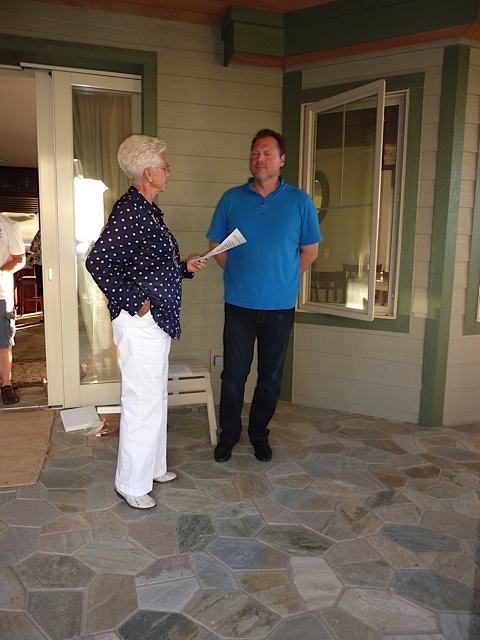 We would especially like to thank Marie Rowe for hosting the party again this year. Merry Christmas to All! Tuesday, Oct 17th we had the pleasure of inducting 3 new members to our club - Michael Blackwood, Anne Shaw & Connor Winter - and as an added bonus our District Governor Abbas Rajabi and Area Governor Deborah Kelly were in attendance. A Great Morning! A special thanks to Gerry Case for taking photos. 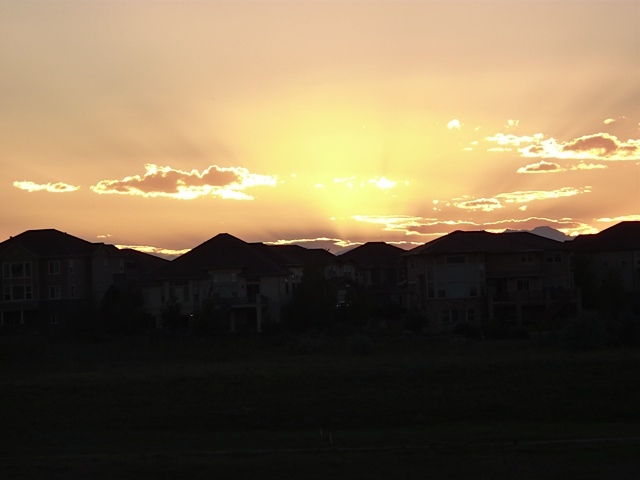 In the summer of 2009, Marv Eakes, a Broomfield High School neighbor and long-time Booster, had a vision for improving the landscape near Broomfield High School. He noticed that for many years, the sidewalk north of the high school - where he often took his walks – was more of a “dandelion nursery” and lay barren, flat and uninteresting compared to other walkways in the city. He envisioned that one day trees could line this sidewalk, providing shade and a more pleasing atmosphere for those passing through the area. There were many challenges, chief among them getting water to the area and identifying staff to maintain the trees once planted. Marv began by working with local leaders and charity organizations to see if there was some way to collectively improve the property. Today, the beautiful tree-lined walkway is once again thriving and growing. Marv looks at the realization of his vision and is very happy with the project, “I’m very grateful to Frank Martinez, the Broomfield Crossing Rotary Club, BHS and its supporters.” Jeff Jones, President of the Broomfield Crossing Rotary Club says of the project: “Rotary is always happy to help improve our community and this was a great project toward that goal.” As time passes, the area will become even more beautiful as the trees grow and become a larger part of the landscape there. 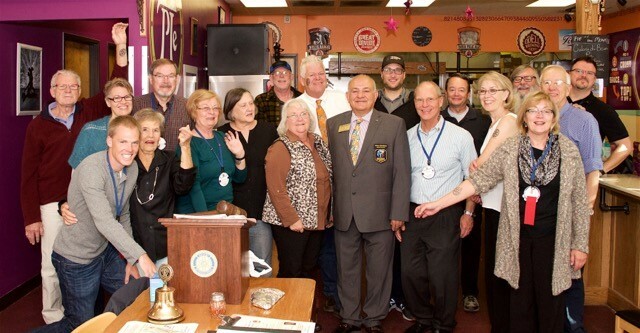 Thanks to all of the Rotary Members that attended the ribbon cutting this week. Great Installation Party tonight for our Rotary Club - District 5450 Governor-Elect Abbas Rajabi joined us for the installation of Jeff Jones as President of Broomfield Crossing Rotary. During the evening Jan Stokes (outgoing President) presented Marie Rowe with the Anne Crouse Award and Jeff Power with the Rotarian of the Year Award. Also shown is a picture of the 4 Jeff's in our club - any other Jeff's want to join us? 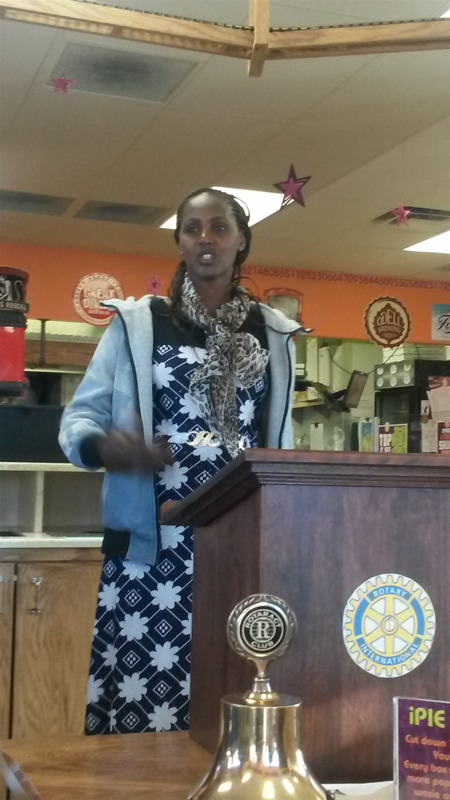 This past Tuesday, Feb 21st we were very pleased to have Habiba Mengesha from Kenya to speak to us about the villages we help support through Global Hope Network International. 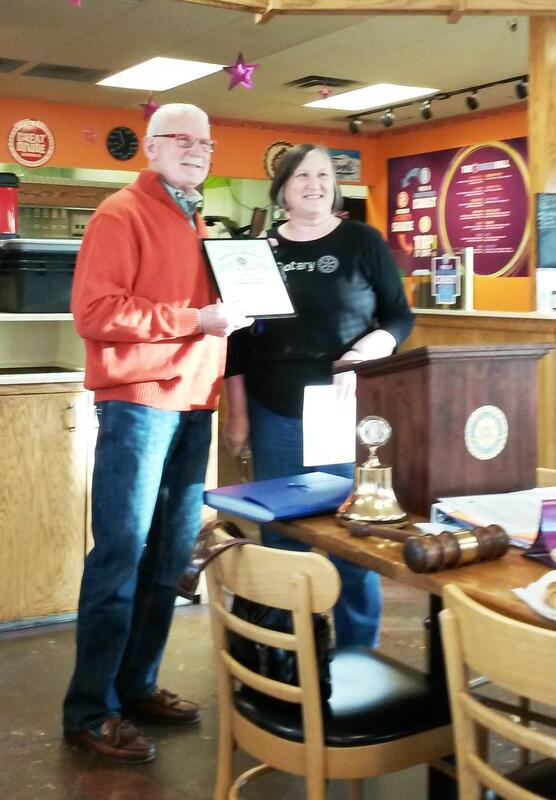 On Tuesday, Feb 7th we officially welcomed Jeff Taylor as a member of the Rotary Club of Broomfield Crossing. 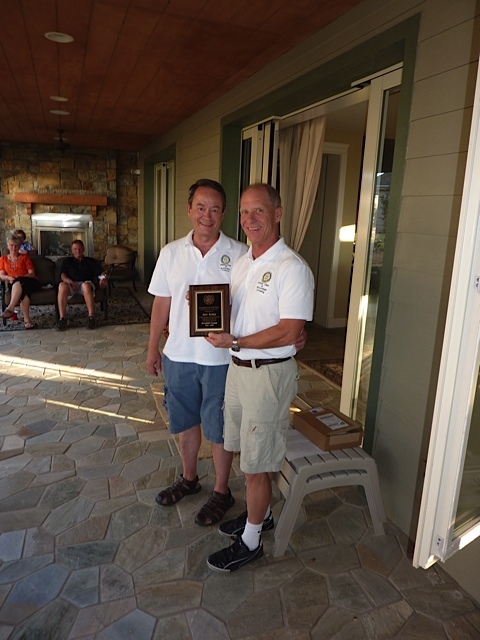 Jeff transferred his membership from the Snowmass club in Aspen, CO. We are so pleased to have Jeff as a part of our club. 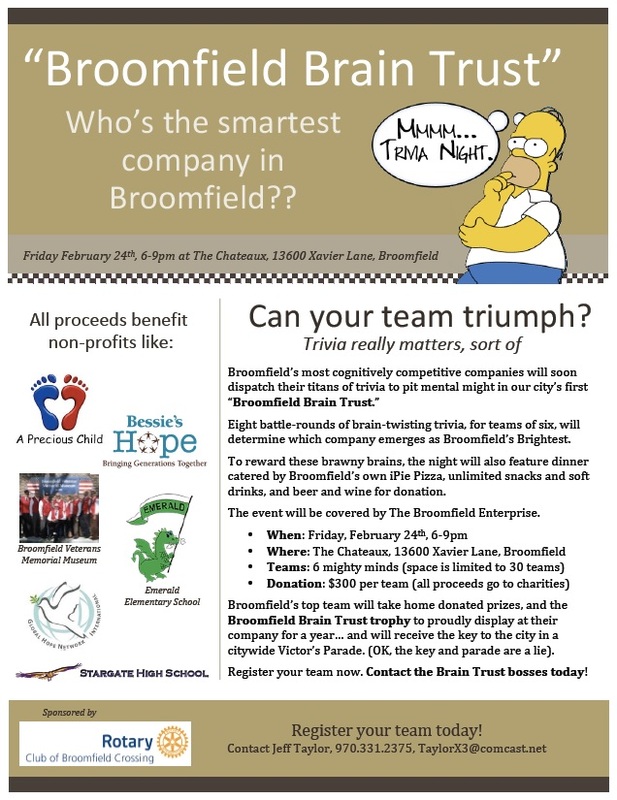 He has already become very active in organizing our Broomfield Brain Trust Trivia Night fundraiser which happens next week - Friday, Feb 24th. 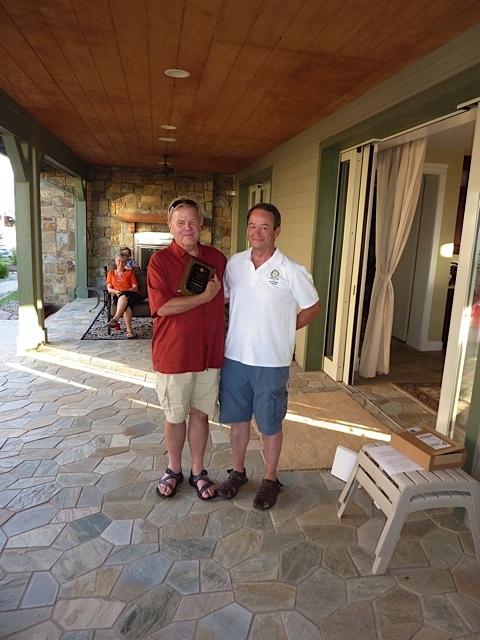 Shown in the picture is Jan Stokes, club President, presenting Jeff with his membership certificate and name badge. 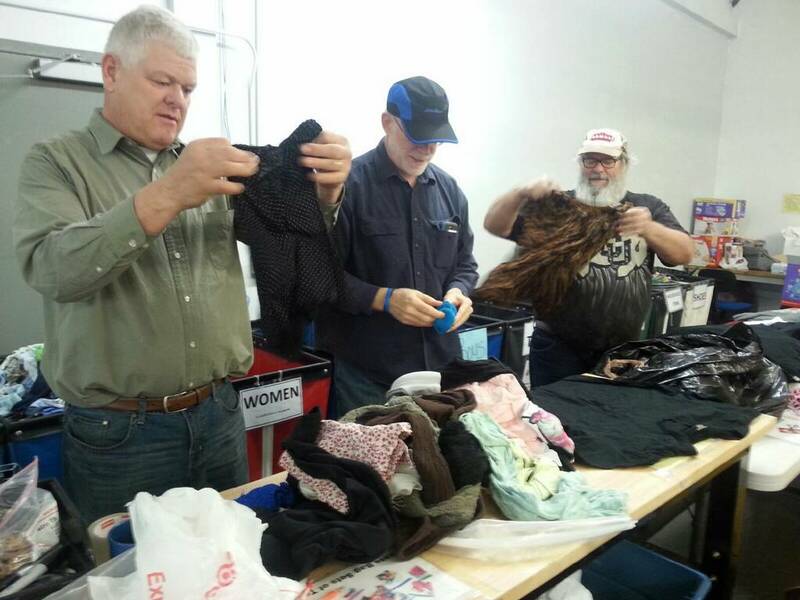 In place of our regular Tuesday morning meeting, member of our club met at A Precious Child to sort clothes that were donated. 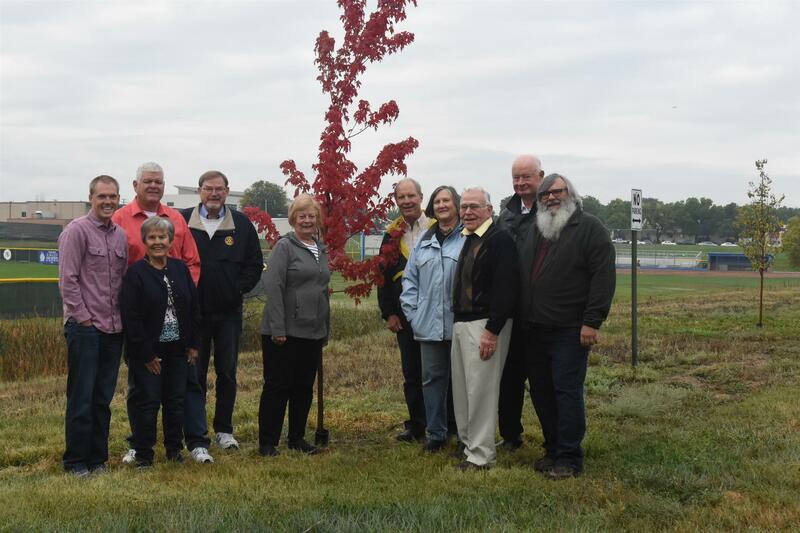 In attendance this morning were Mike Danials, Ed Black, Peter Crouse, Jeff Taylor, Jeff Jones, Bill Muirheid, Larry Hendershot, Alice Kidney, Nancy Clark, Joyce Cook, Bev Swenson, Lee Trexler, and Jan Stokes. 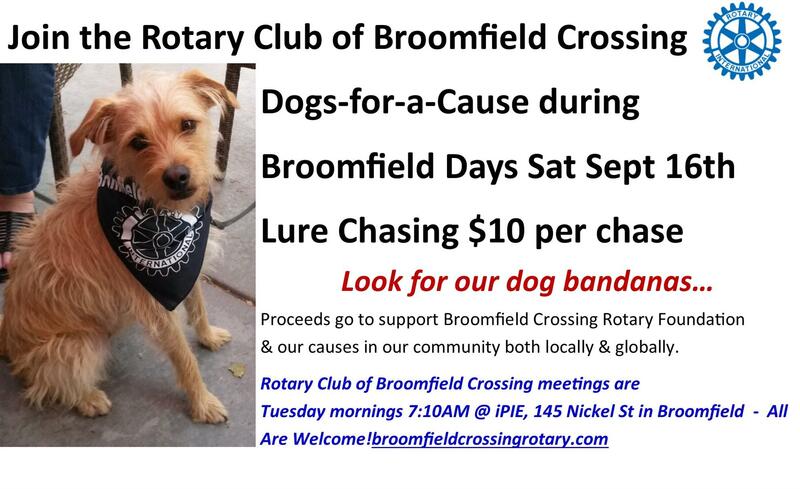 As part of our yearly grants from our Broomfield Crossing Rotary Foundation, Jeff Power provides updates from the villages we help support. 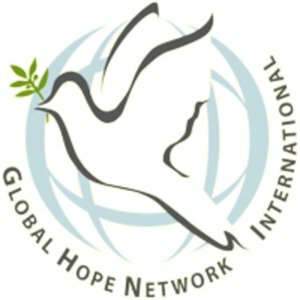 The latest reports are going to be posted to our Home Page Download Files - just click on the "Global Hoe Network International update" and a pdf will open on your computer, tablet or phone. Remember to check it on a regular monthly basis to see the good work being done. 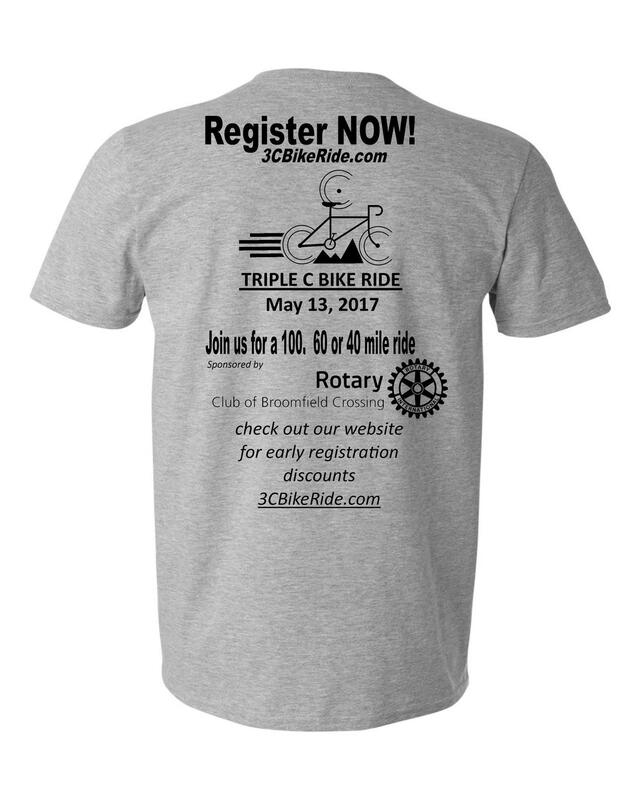 Pass the word around - get TEAMS to sign up for a fun night! 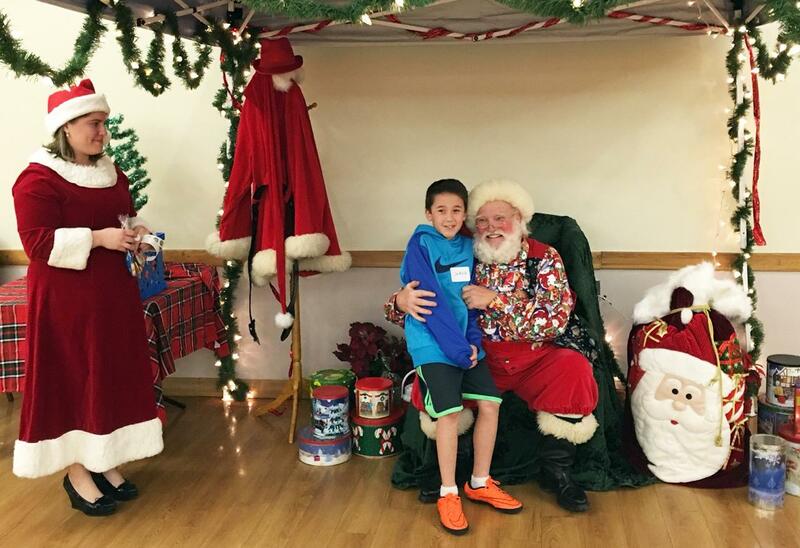 Our Santa Visits were a huge success this year. 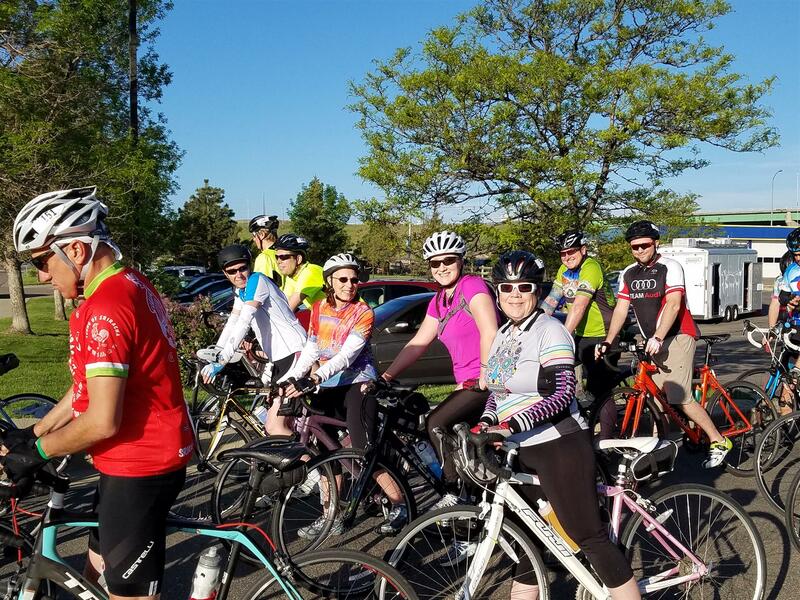 Thanks to everyone that helped last week … and a REALLY BIG THANKS to Mike Daniels and Marie Rowe for all of their time and energy. Here is a thank you video from FRIENDS. Please note delivery date, time and location for this year's peach delivery! They promise to be very tasty! 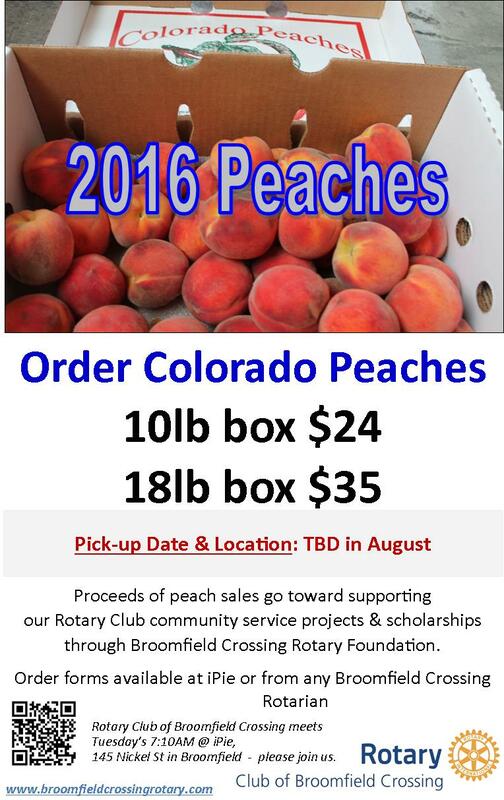 It's time again to get out there and sell boxes of Peaches to benefit our Broomfield Crossing Rotary Foundation and all of the grants we award throughout the year in our community, both locally and globally. Let's see who can sell the most - there will be a prize for the winner! 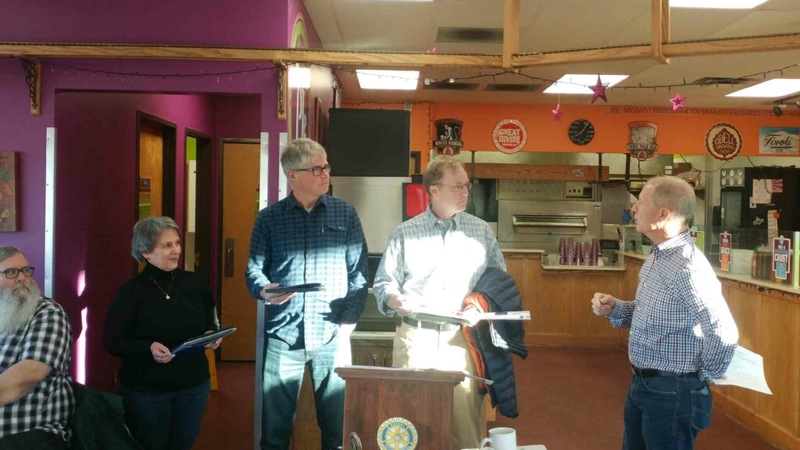 Wendy Roman Aguilar - presenting the award is Rotarian Jeff Power supported by Rotarian's Dan Jorgensen, Carol Norcross, and Joe Sindelar. 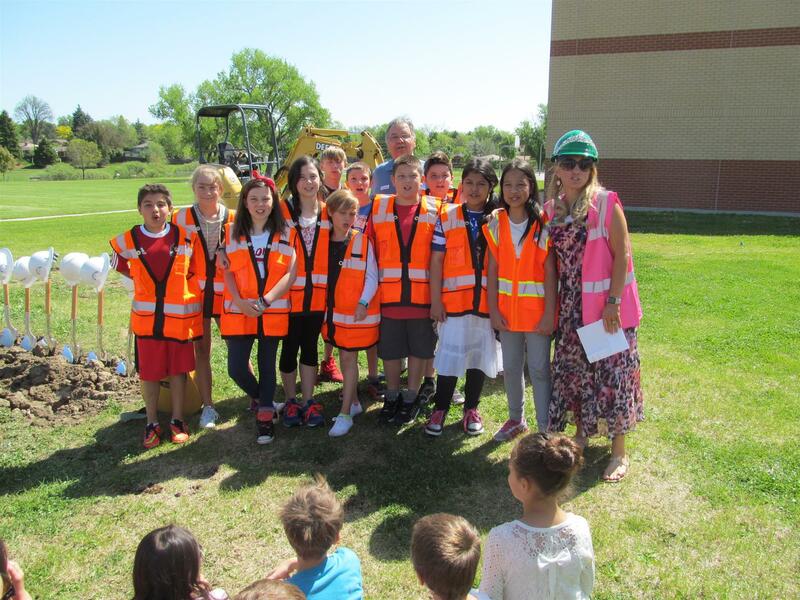 Rotarians also participated in the new Emerald School ground breaking ceremony. 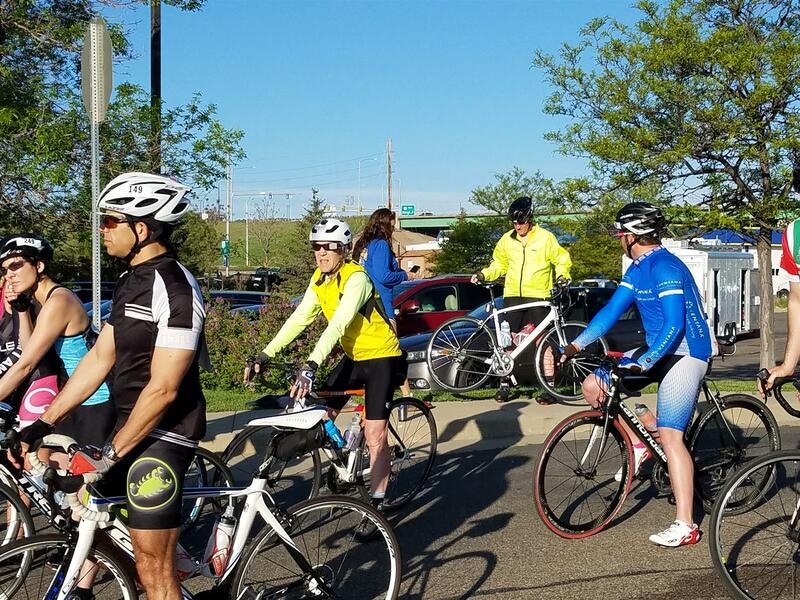 Thanks to all of the riders that came out to support our Triple-C Bike Ride last Saturday. 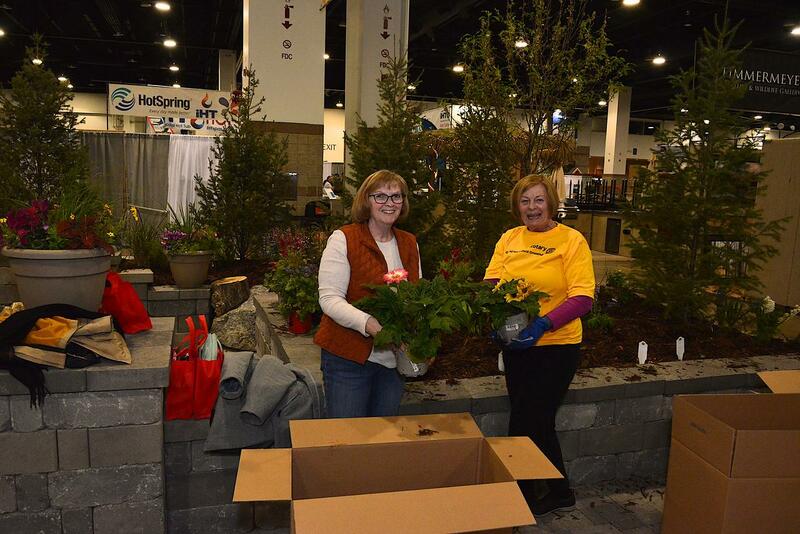 We really appreciate your support...and thanks to all of the volunteers that made it possible. 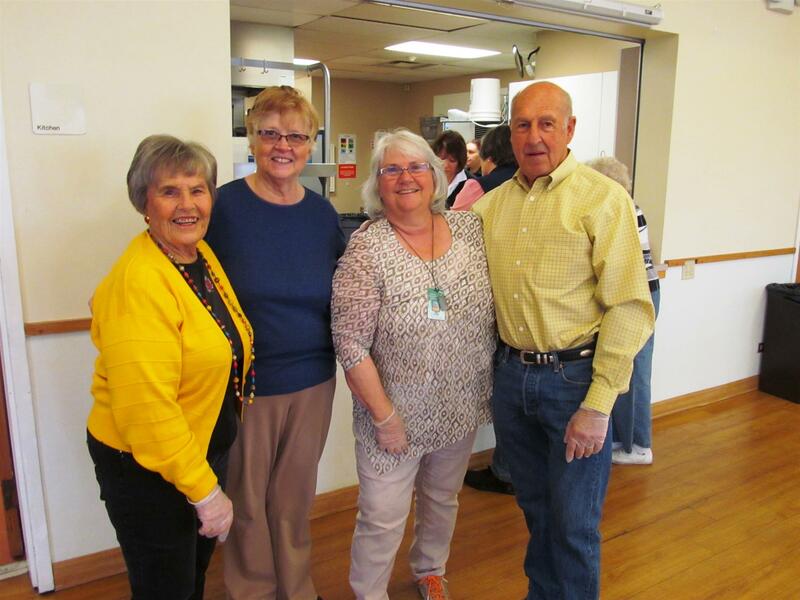 Today, Friday April 29th Broomfield Crossing Rotarians helped to serve lunch at the Broomfield Senior Center. 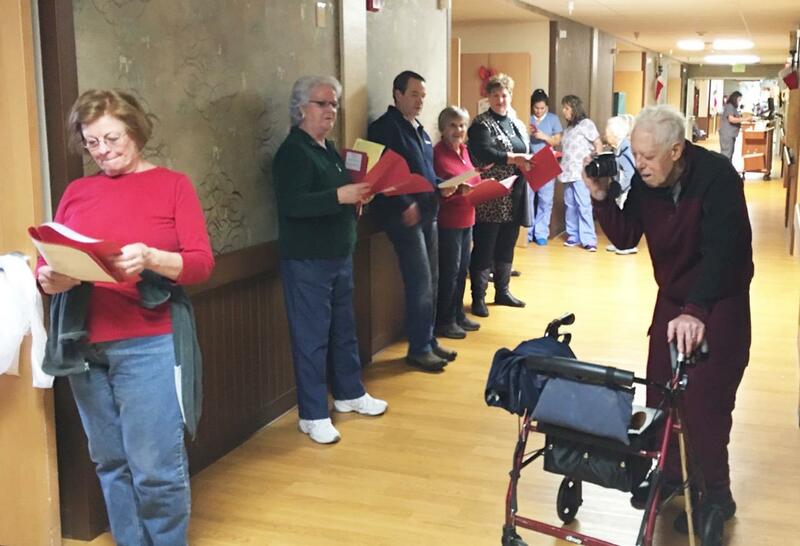 Thanks to Dan and Susan Jorgensen, Jan Stokes, Joe Sindelar, Bev Swenson, Lee Trexler, Carol Norcross and Joyce Cook for showing up to help. Some are shown in the photos below. 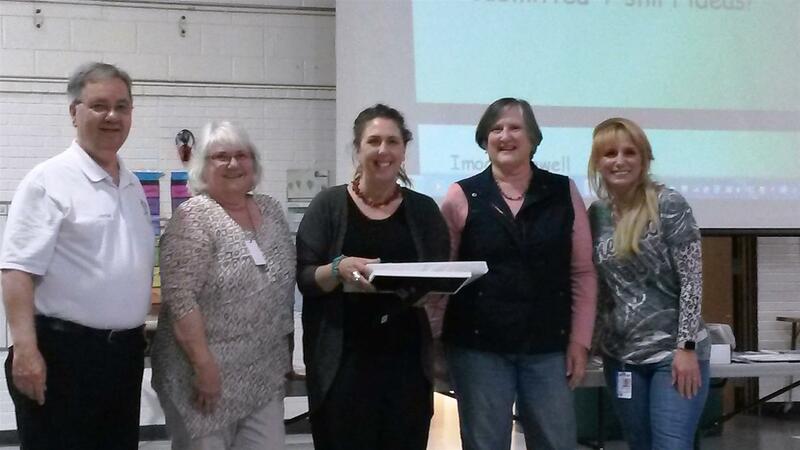 Today, Friday April 29th we presented Citizen of the Month at Emerald Elementary School to Lauri Skidmore, a teacher nominated by fellow teachers. 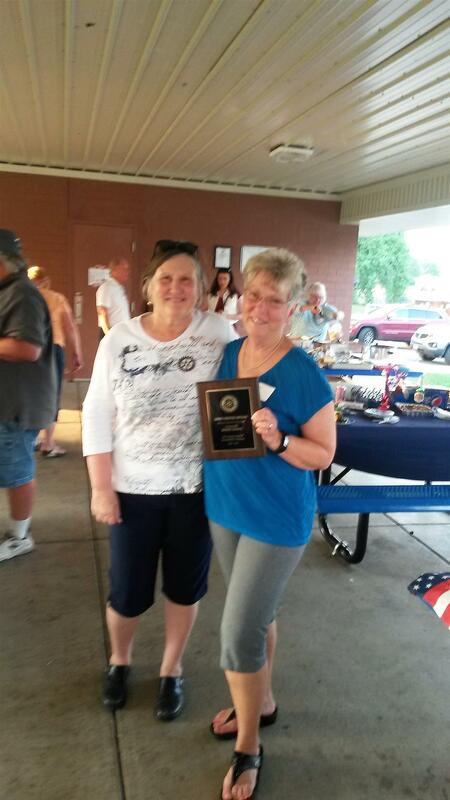 President-Elect Jan Stokes presented the award. 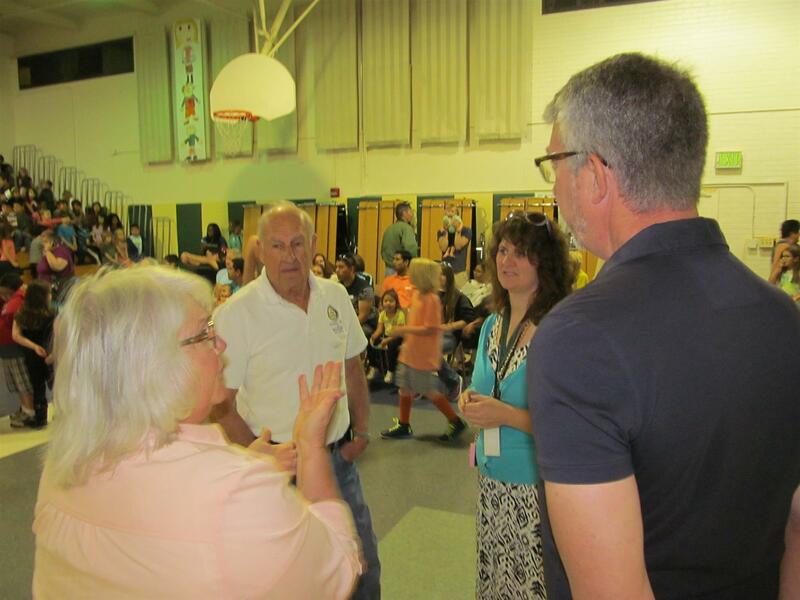 Shown in the picture (l-r) are Rotarians Dan Jorgensen and Carol Norcross, Lauri Skidmore, Jan Stokes, and Emerald Elementary School Principal Samara Williams. 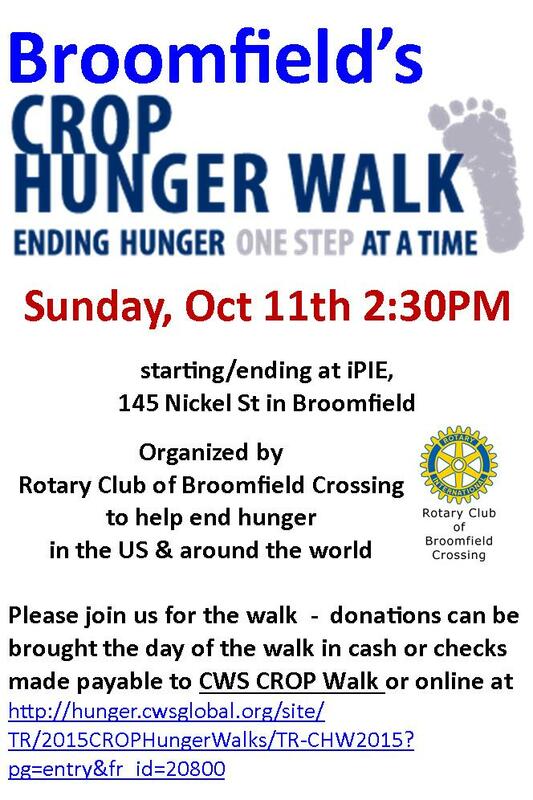 Each month we have our Business Meeting on the 4th Tuesday - each month we collect oatmeal for Broomfield FISH - 86 lbs of oatmeal delivered to Broomfield FISH this week - way to go Rotary Club! ...and thanks to Jan Stokes for delivering. 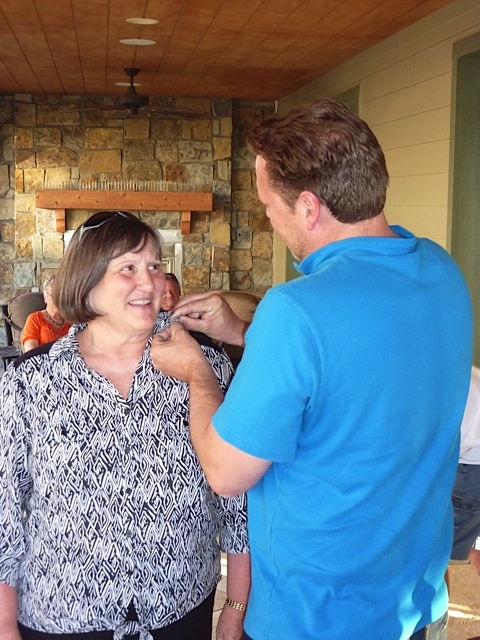 On Tuesday, April 26th we were pleased to induct Joyce Cook as the newest member of our Rotary Club. 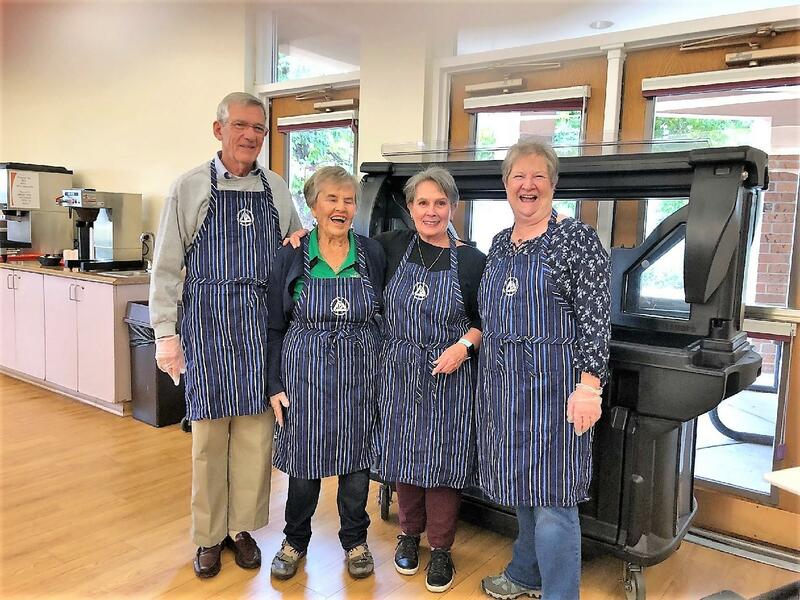 We look forward to Joyce becoming involved in our service projects with her already volunteering to help with Senior Center lunch service and Triple-C Bike Ride activities. Welcome to the club Joyce! 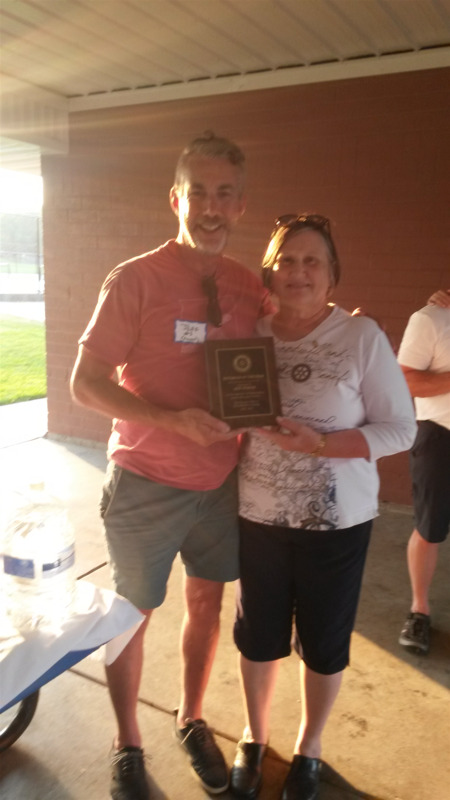 Presenting Joyce (on right) with his certificate is Club President Gary McKee. 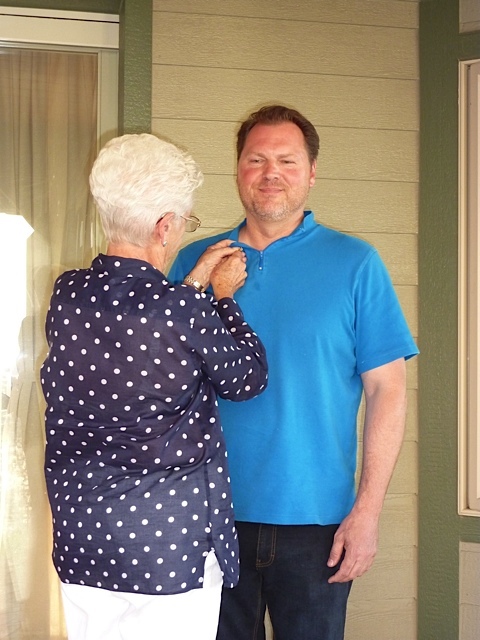 On Tuesday, April 19th we were pleased to induct AJ Kruesel as the newest member of our Rotary Club. 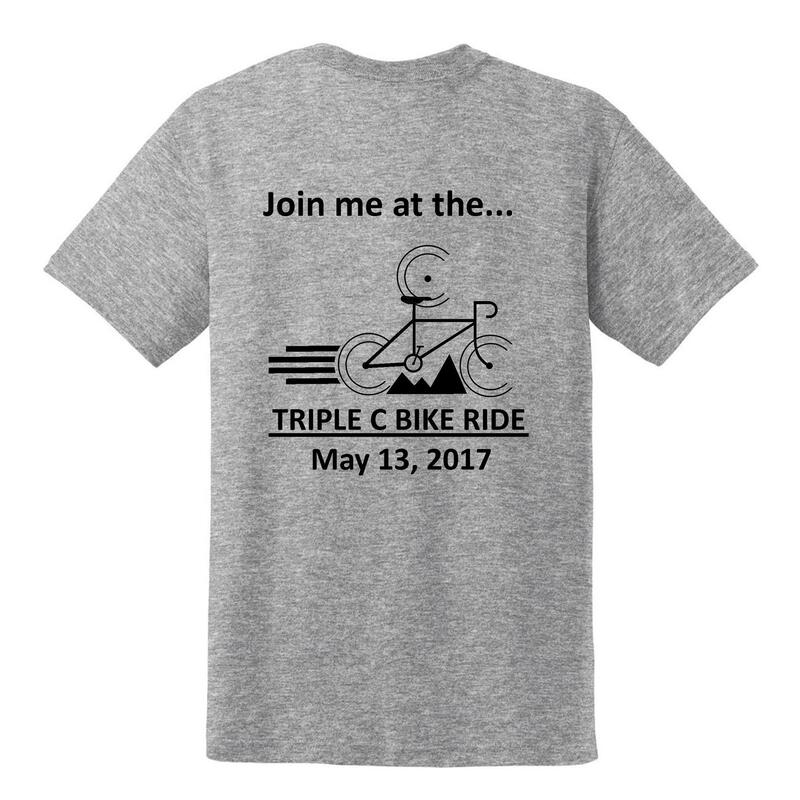 AJ has already become involved in our Triple-C Bike Ride planning committee. Welcome to the club AJ! Presenting AJ (on right) with his certificate is Club President Gary McKee. 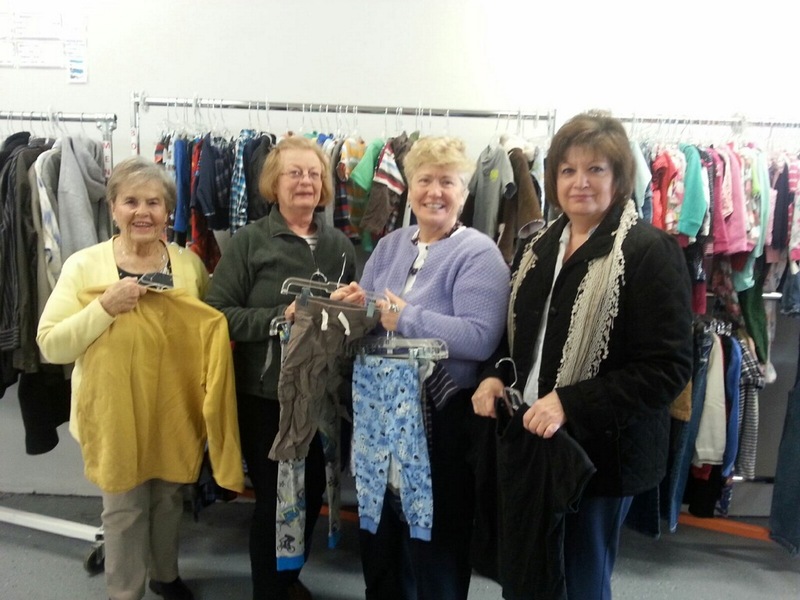 A Special Thanks to Nancy Clark, Alice Kidney, Larry Hendershot, and Jan Stokes (taking the pic) for sorting at A Precious Child on Tuesday, March 29th. 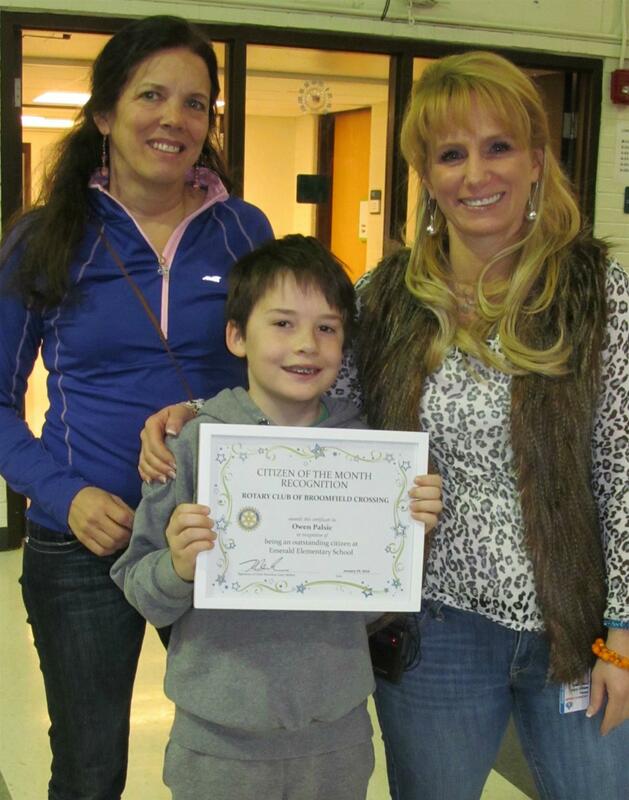 The Broomfield Crossing Rotary Club honored 5th grader Stella Hostetter as the Emerald Elementary School "Citizen of the Month" at a March 18 presentation at the school's monthly assembly. Stella was nominated for the award by her teachers, Melissa Tingley and Carrie Troxel, for her fundraising efforts on behalf of another local child who has had a serious illness and is fighting for life after having severe neurological damage as a result of the illness. Stella has raised over $400 and also used her own birthday money to add to the fundraiser. 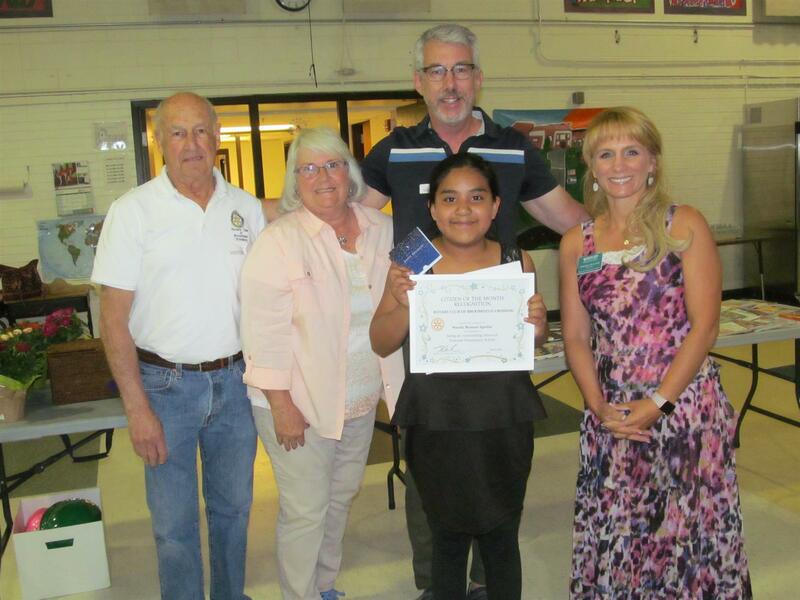 Rotary President Gary McKee, who noted that Stella's effort exemplifies Rotary's motto "Service Above Self," presented the award and a gift certificate to Barnes & Noble Books to Stella to honor her efforts. 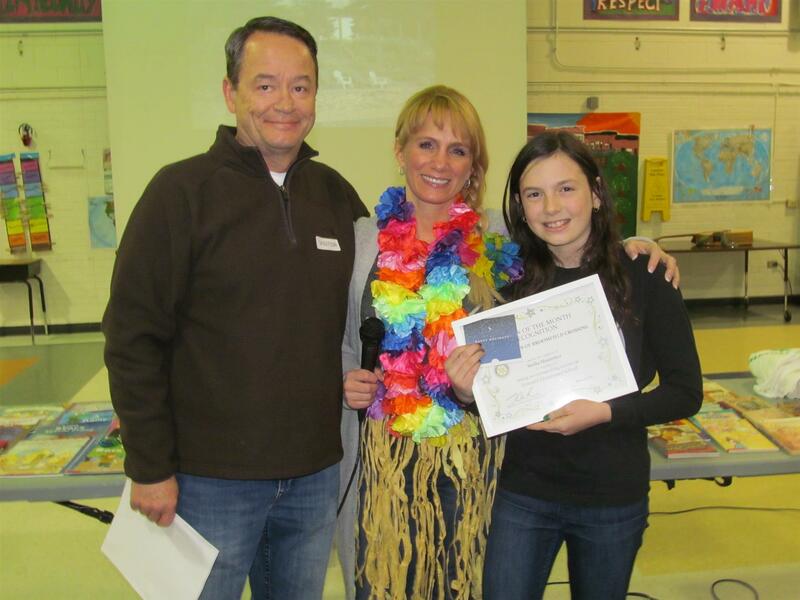 Photo Caption -- Stella Hostetter, right, was presented the Broomfield Crossing Rotary Club's "Emerald Elementary Citizen of the Month" award from Rotary President Gary McKee and Emerald Principal Samara Williams at the March 18th assembly at the school (where Principal Williams was dressed to promote an upcoming Hawaiian Luau event at the school). 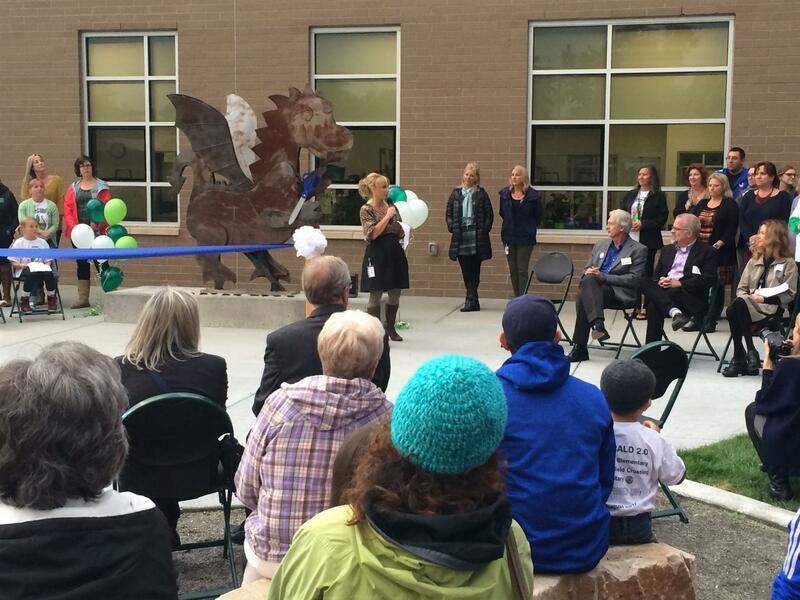 Thanks to Dan Jorgensen for his continued coordination of events with Emerald Elementary School. February is Flower Power month! 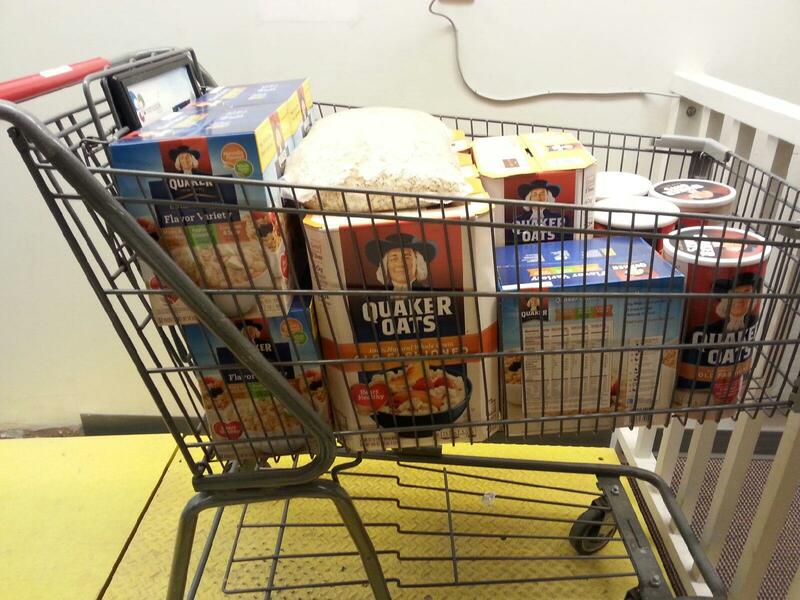 January's Oatmeal Donation to Broomfield FISH food bank was 91 lbs. 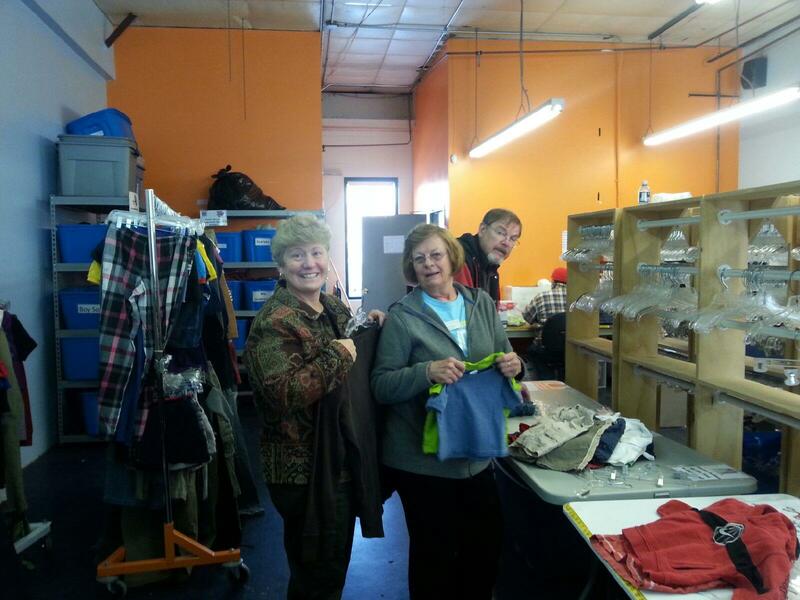 Way to go Rotary - and a special thanks to Jan Stokes for delivering. Dan Jorgensen presented Owen Palsic with Citizen of the Month award on Friday, January 29th at the Emerald School assembly. 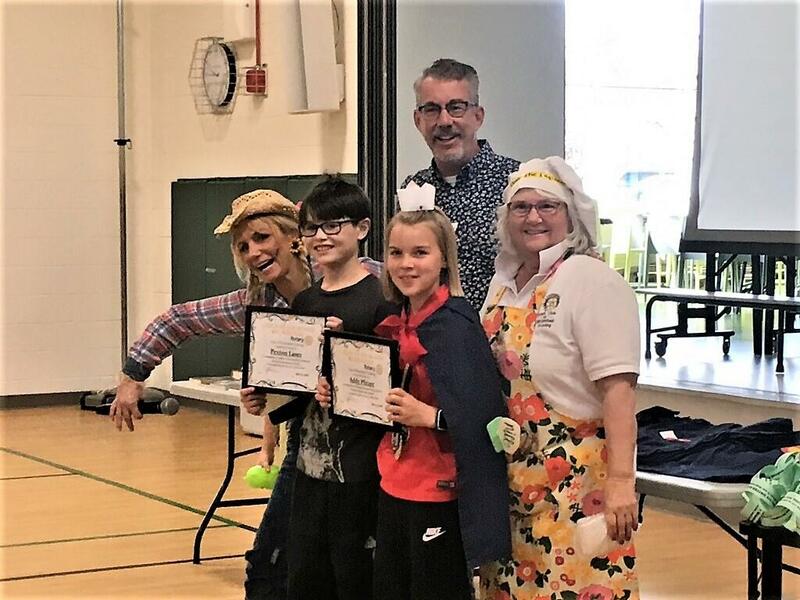 Shown in the picture are Terri Diamond (4th grade teacher of our awardee), Owen Palsic, and Emerald School Principal Samara Williams. 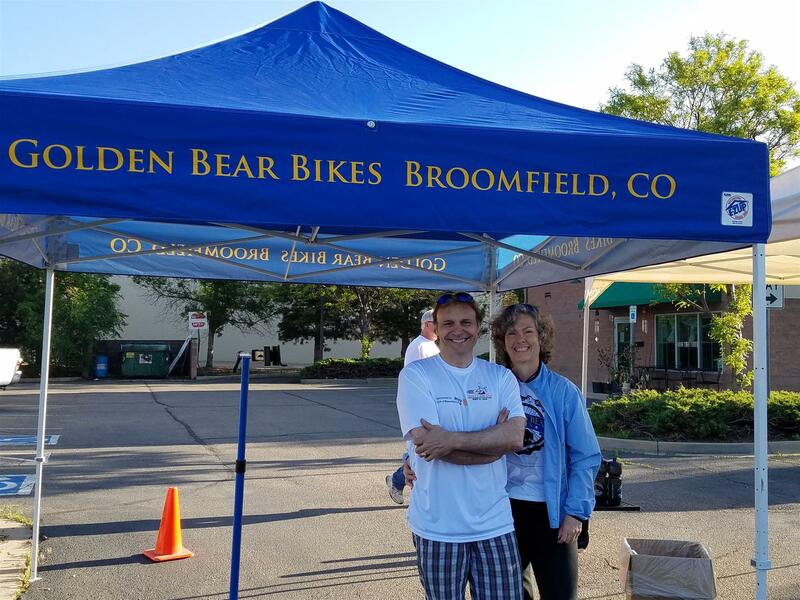 Thanks Dan for doing a great job of representing Rotary Club of Broomfield Crossing. 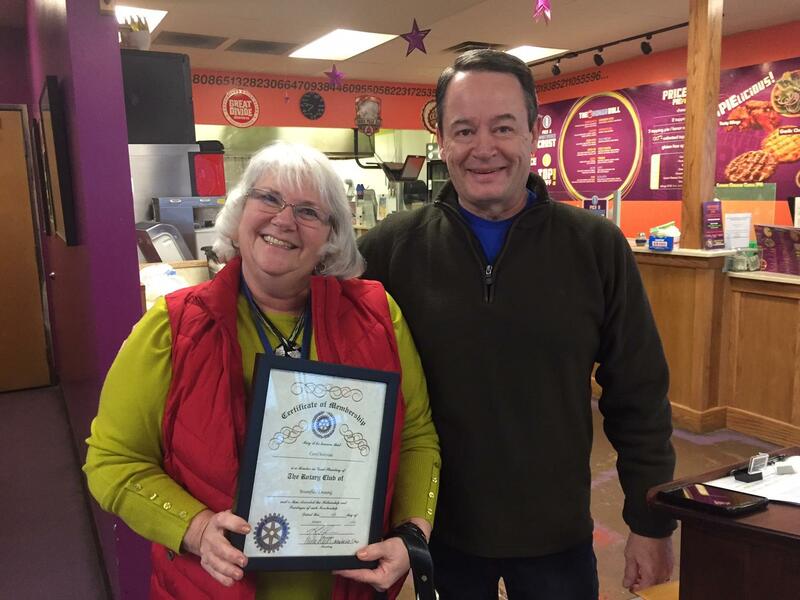 We were pleased to induct Carol Norcross as the newest member of our club on Tuesday, January 19th. Welcome Carol! 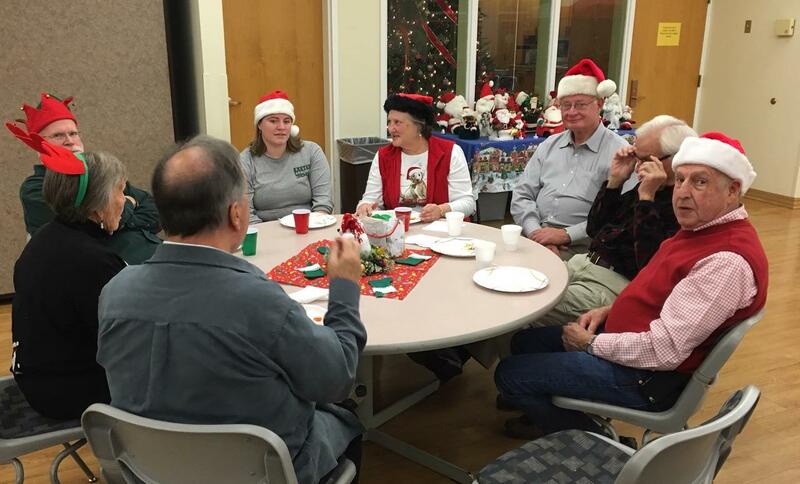 A BIG THANKS to all those who attended the Citizen of the Month presentation on December 18th. 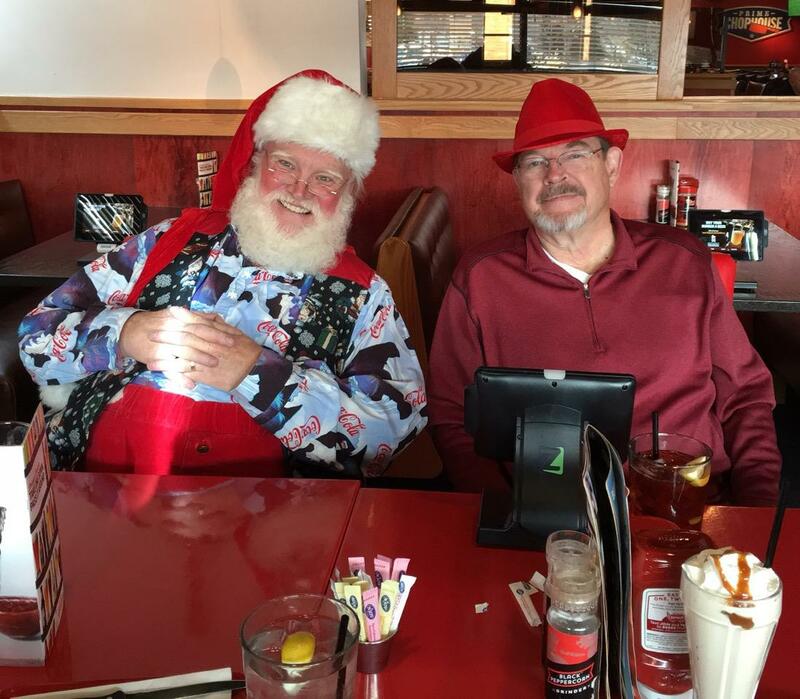 A HUGE THANKS to Larry Hendershot for organizing our Santa Visits again this year. 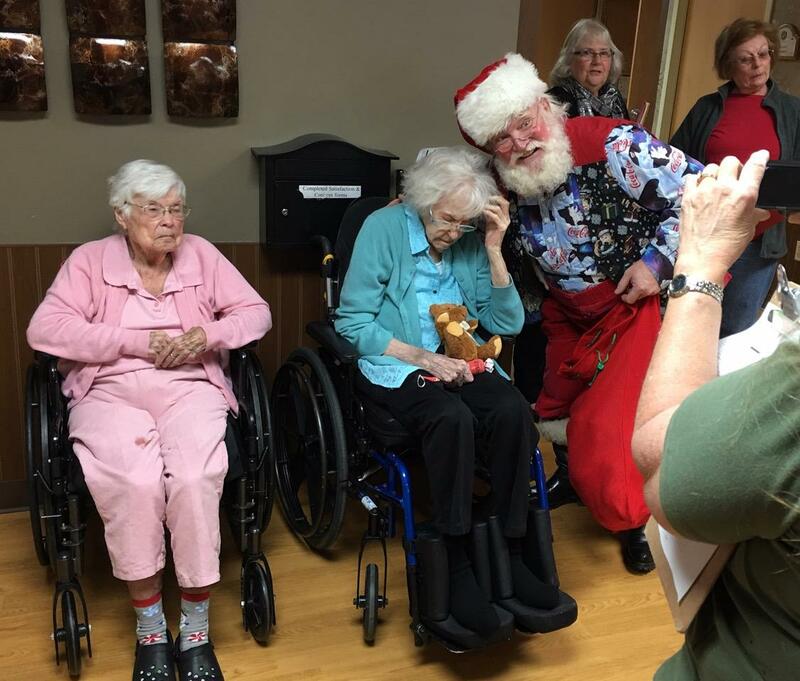 The visits and party were a great success - hopefully we made the holidays special for a number of people in and around our community. 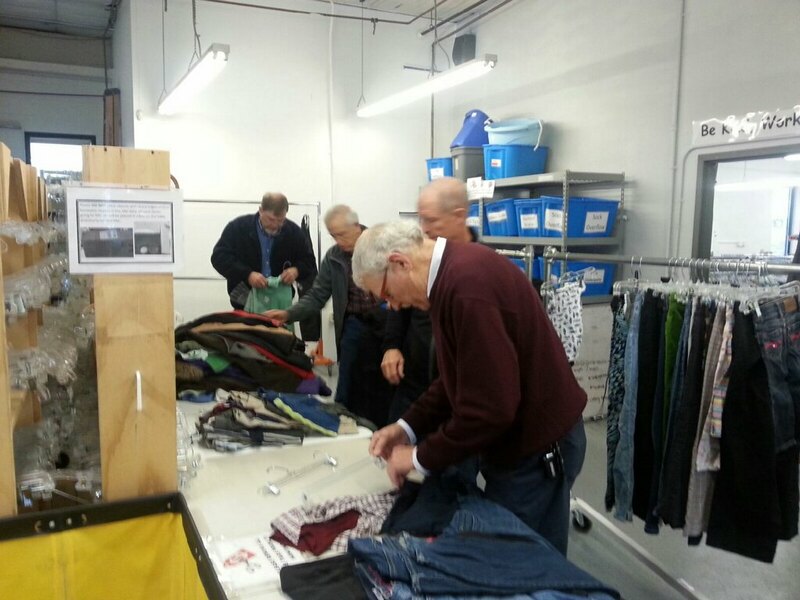 Thank you to all of the Rotarians who came out to help over the 3 days this past week. Please enjoy the photos. 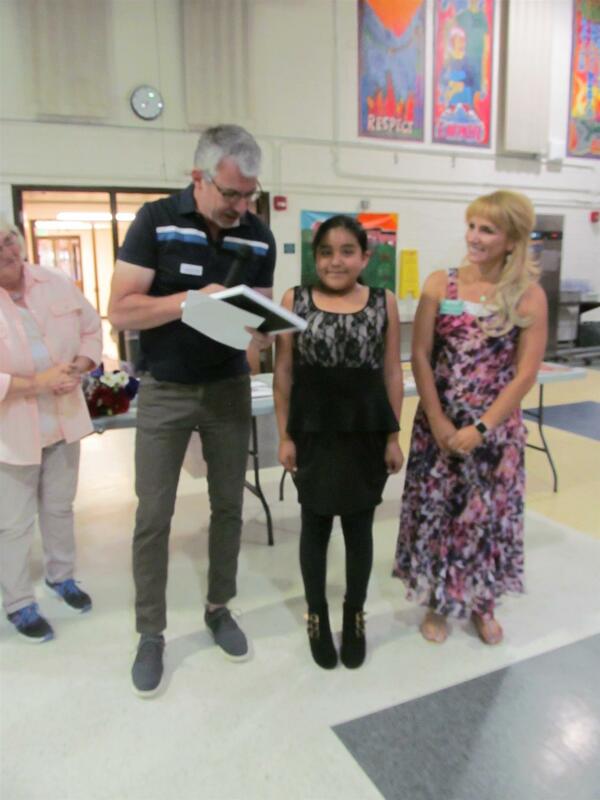 Alyssa Romero, a 3rd grader who organized a food shelf drive for F.I.S.H., was the recipient. 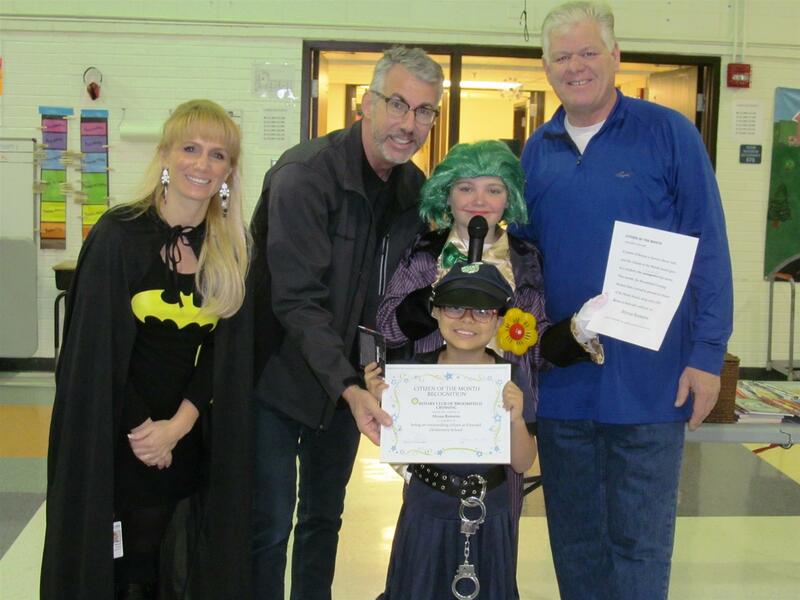 Pictured with her are Samara Williams, principal, Rotarians Jeff Power and Pete Crouse, and 4th grader Jordan Barrett, "acting principal" (dressed as The Joker) for the school's Halloween day events. 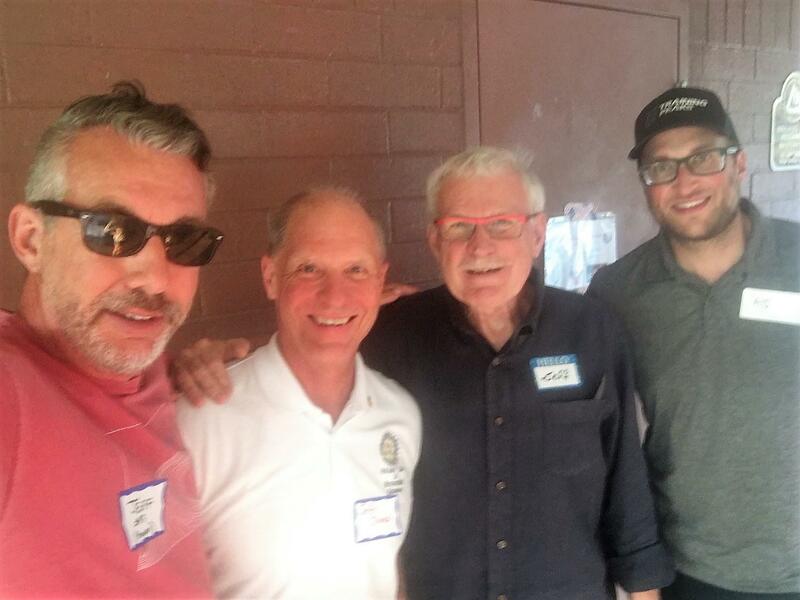 Every Thursday at 5PM Rotary members, friends, etc meet up for beer and ping pong at Wonderland Brewing 5450 W 120th Ave, Broomfield, CO 80020. 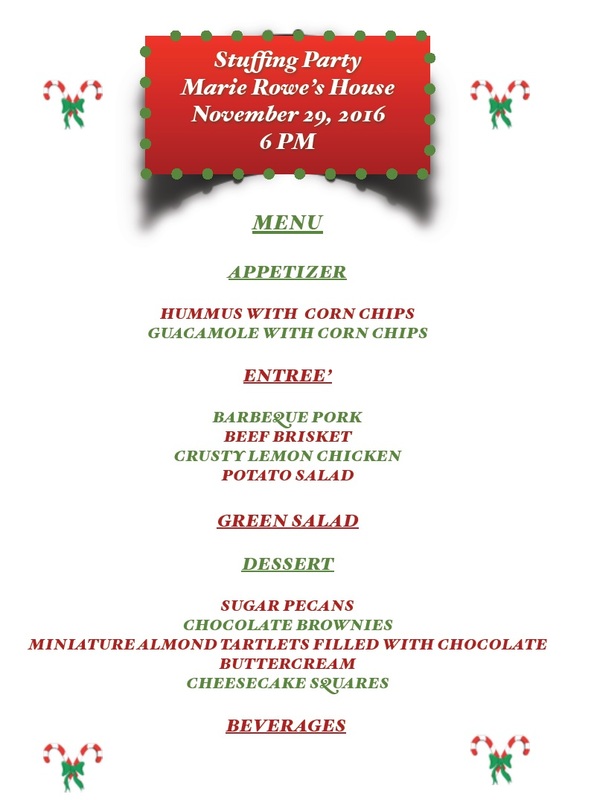 Come and enjoy the FUN and FELLOWSHIP! 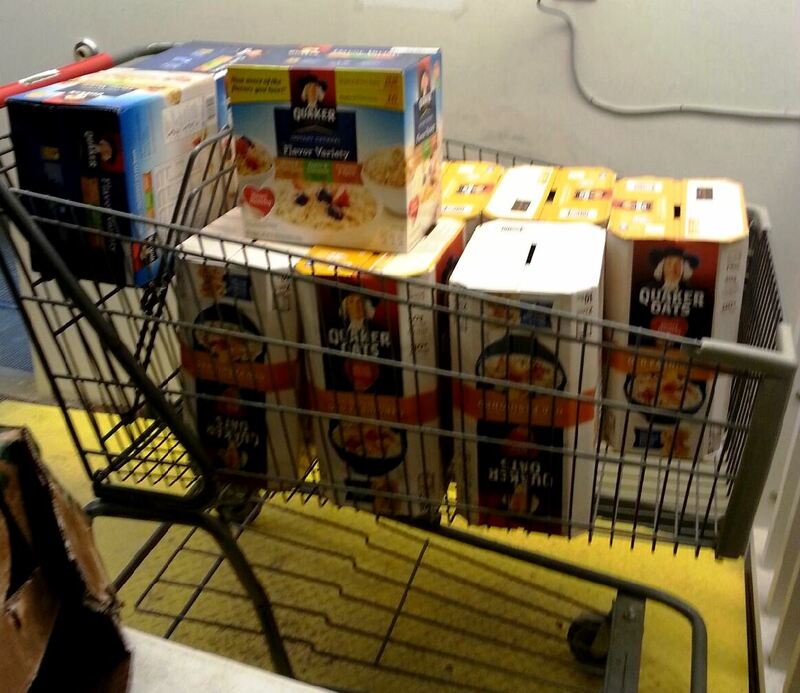 OUR 2015 PEACH SALES WERE A HUGE SUCCESS!!! 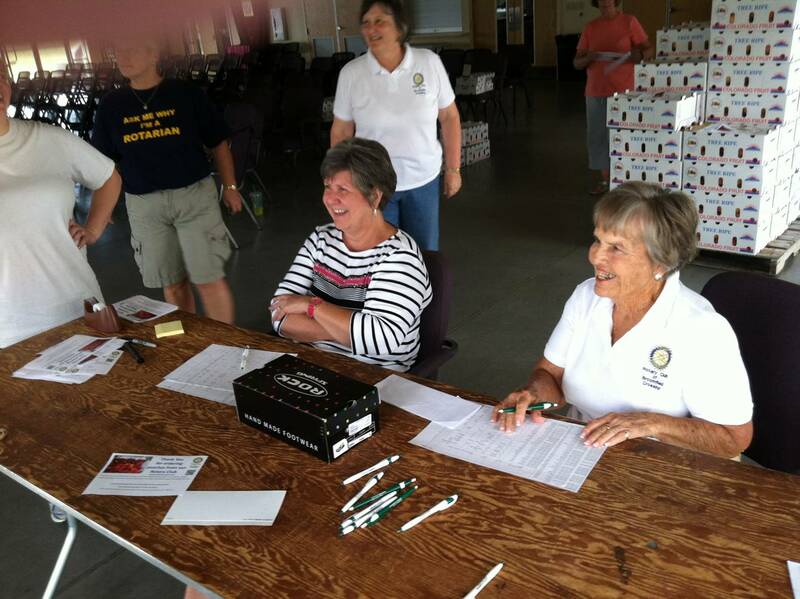 Rotary Club of Broomfield Crossing took order for and delivered over 3,840 lbs of juicy Colorado Peaches from Palisade on the western slope of Colorado. We would like to thank everyone for ordering from us and hope that you are pleased with this years crop. We look forward to growing sales even further next year. Thank You - Thank You - Thank You!!! 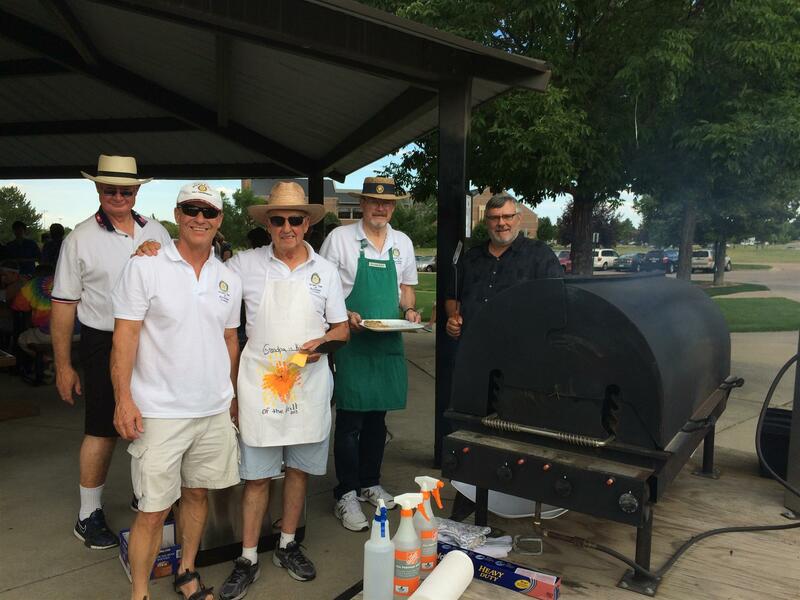 On Wednesday, August 5th Rotary Club of Broomfield Crossing hosted a BBQ for Broomfield's Sister City visitors from Japan. Shown in the photo are Lee Trexler, Jeff Jones, Joe Sindelar, Larry Hendershot, and Mike Daniels. 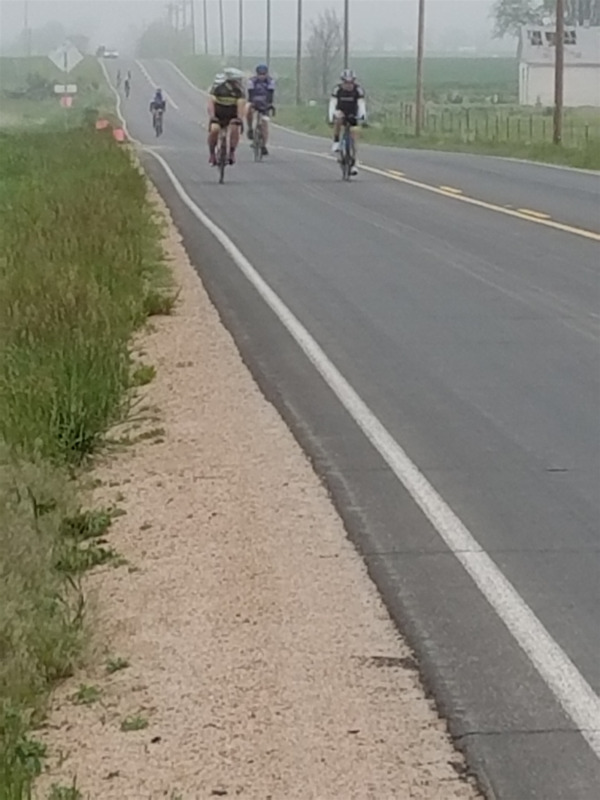 Those not shown but were of tremendous help were Bev Swenson, Jan Stokes (buyer of everything) and Kurt Kaple (Club President) ... and I think Bill Scolari showed up to help clean-up. 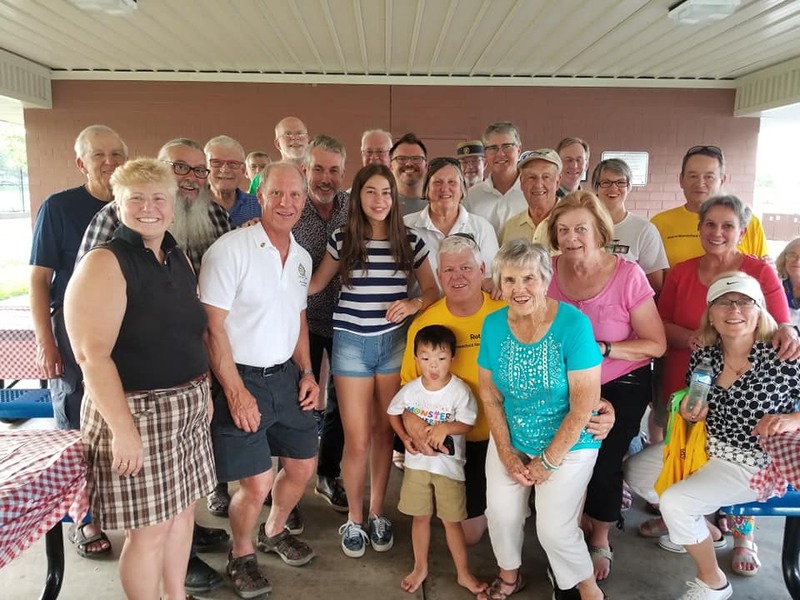 At our club meeting on Tuesday, August 4th we presented Nicole Salter, Vice President of Development of A Precious Child with a check for $6,000.00 from the proceeds of our 2015 Triple-C Bike Ride. Shown presenting the check to Nicole are Bill Scolari (Program Chair), Gary McKee (Past-President 2014-2015), and Jeff Jones (Triple-C Committee Chair). 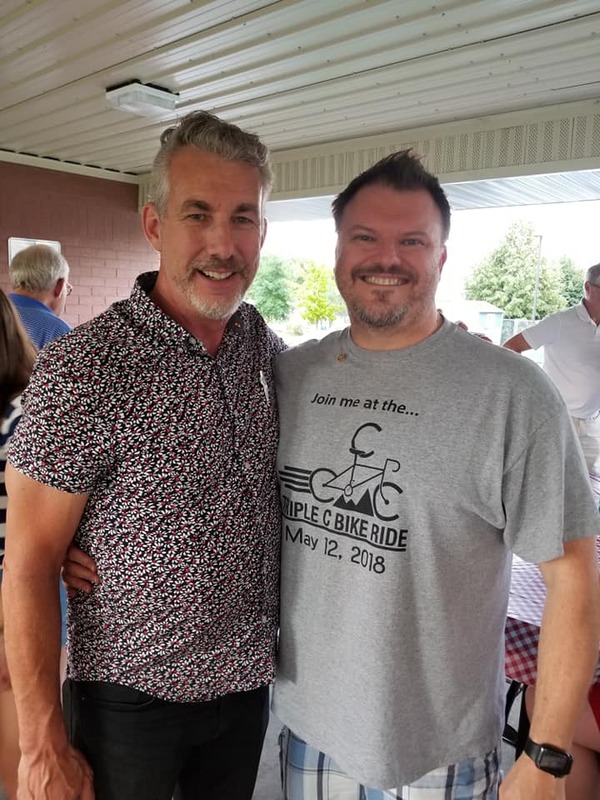 We had a great evening last night for our Installation and Recognition Party hosted by Nancy Clark at her home looking over the Aurora Reservoir. 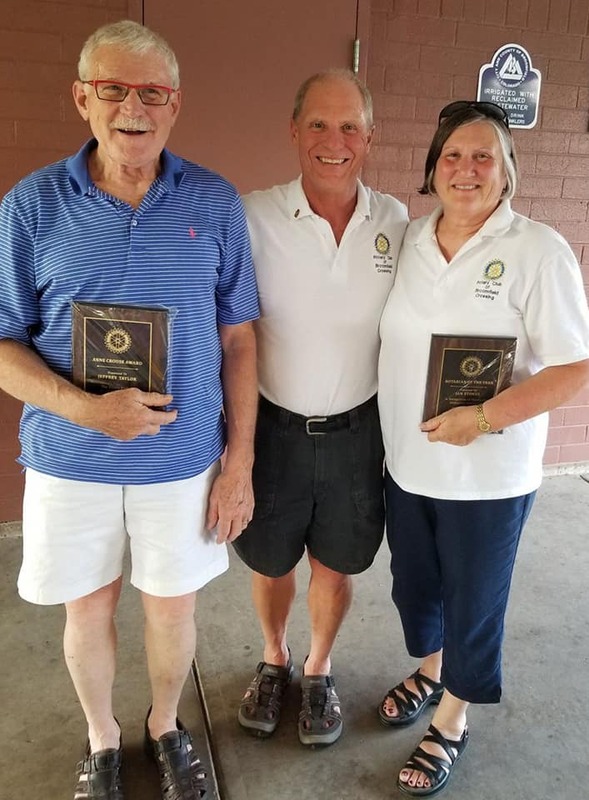 Jeff Jones was awarded Rotarian of the Year, Bill Scolari was awarded the Anne Crouse Award for his service, Kurt Kaple was installed as the new President of our club by District Governor Mary Kay Hasz, and Jan Stokes was given her President-Elect pin. If you were not able to make the party - we missed you. Thanks to everyone in the club for making my year as president a success - we can not do this alone - we can accomplish much by working together. Sante Crutcher. 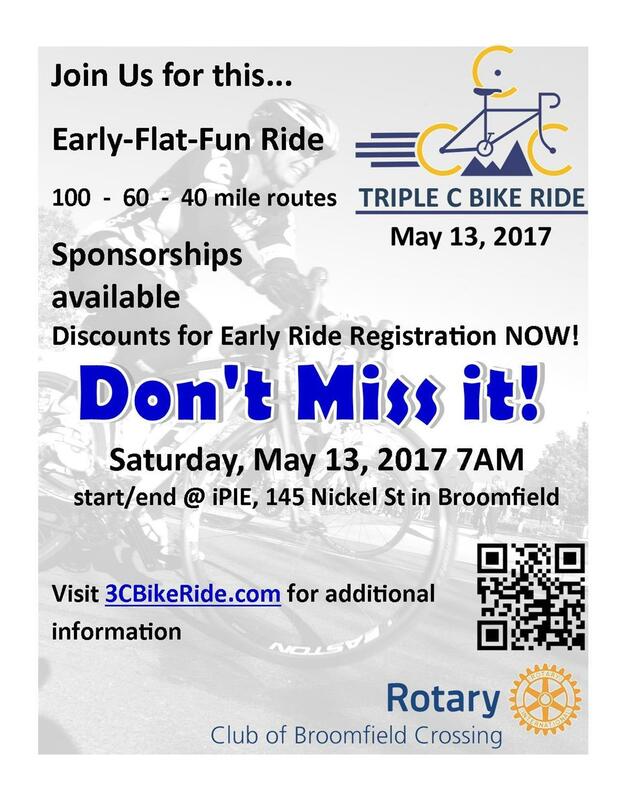 Shown in this photo are Mike Daniels from Broomfield Crossing Rotary, Sante Crutcher, and Samara Williams principal of Emerald Elementary. We recognize students on a regular basis for their Service above Self. Congratulations to Sante and his family.